A provincial election was held in British Columbia (Canada) on May 14, 2013. The 85 seats in the provincial Legislative Assembly are elected to four-year terms (fixed election dates) by FPTP in single-member constituencies. British Columbia is a Western province, but it is distinct from the other three ‘landlocked’ Western provinces and forms a fairly unique entity unto itself. The politics of the three other Western provinces were marked, in the early twentieth century, by agrarianism and Prairie populism in the form of the Progressive or United Farmers parties; years later, despite major political and social changes in these provinces, the political culture still bears the stamp of agrarianism and Prairie populism. British Columbia, however, was never marked by such agrarianism. Instead, BC has been defined as a “company province” by some, referring to the province’s historical dependence on the extraction of natural resources (forestry, fishing, farming, mining/minerals including coal). The fortunes of the different industries have risen and fallen (fishing and farming are much less important, while natural gas, mining, lumber or oil pipelines are more important), but the general structure of the economy – tied to the extraction of primary resources – has not changed much, notwithstanding the contemporary tertiarization of the economy (services, tourism, financial industry etc). BC’s political culture has been shaped by its history as a company province. One particular element, tied to its economic structure, which has coloured BC’s political culture is a strong, militant and politically active organized labour movement. The British and American working-class immigrants who came to work in BC’s coal and metal mining industries at the turn of the last centuries brought with them ‘radical’ ideologies (such as socialism) and militant trade unionism. The outlook of the employers, the poor and harsh working conditions of the working-class, insecurities linked to Asian immigration and the nature of provincial politics post-Confederation create a strong class cleavage and led workers to organize politically to remedy problems which they felt could not be remedied by union activism alone. Farmers, however, never developed a class consciousness as in the other Western provinces. They were a fairly comfortable social group (hence more favourable to traditional conservative politics) which did not share the economic and political grievances of Albertan or Saskatchewan farmers. Secondly, BC’s physical characteristics (geographic features which long inhibited communication and promoted isolation) and the diversity of its agriculture (grain in the Peace River basin, fruits in the Okanagan, vegetables in the Lower Fraser Valley etc) hindered the formation of a farmers’ class consciousness and agrarian ideology. As a result of these social conditions, socialism quickly became a potent political force in BC (unlike in the other provinces, despite the social radicalism of some Gingers in the Progressive or United Farmers parties) while agrarianism and rural populism never found significant support in the province. By way of example, BC elected Socialist MLAs as early as 1903 (Labour candidates had won seats since the 1890s) but the federal Progressive Party only won 12% and 3 seats in the 1921 federal election. Class and regional antagonisms have defined BC politics for most of its history. The strong class cleavage has created (starting in the 1940s) a two-party system between the social democratic New Democrats (NDP) and a “free-market party” (currently the BC Liberals, formerly the BC Social Credit Party, SoCreds). Reinforcing the class cleavage is the fact that, historically, BC has also attracted entrepreneurial capitalists and rags-to-riches self-made capitalists. Corporate business has a long history of directly intervening in provincial politics, to guard off “socialist collectivism” or to ensure favourable (preferential) treatment for businesses and individuals by the government. Regional antagonisms have not created political parties, but they have played a large role in electoral behaviour and partisan strategies. About three-fifths of the province’s population lives in the Lower Mainland, an extensively urbanized metropolitan conglomeration driven by the city of Vancouver. There has always been a distinct divide between the Lower Mainland, Vancouver Island (which includes the capital city, Victoria) and the BC Interior. In recent years, BC has seen a massive influx of immigration – 27% of the province’s population are visible minorities (non-white) – most either Chinese or South Asian (predominantly Punjabi). Reinforcing this internal regional divide is a lingering sentiment of Western alienation shared with the Prairie provinces and Alberta. Between 1871 (when BC joined Confederation) and 1903, provincial politics were non-partisan, with no officially recognized factions although candidates and MLAs tended to align with either the ‘government’ or ‘opposition’. Provincial governments busied themselves at extracting concessions from the federal government (such as railways) or distributing railway charters and timber/mining rights to friends. As such, they often sought to be on the good side of the federal government, and since the federal government during this era was almost away Conservative, most provincial cabinet ministers tended to be de facto Conservatives although this was by no means absolute – Tories and Liberals were to be found on both sides of the aisle. By the turn of the century, non-partisan government became an unstable mess of bickering parochial interests – this not only made stable government hard, it also inhibited economic growth and allowed organized labour to flourish in a context of a fluid legislature. Partisan politics, divided along traditional pan-Canadian lines of Liberal and Conservative, were adopted in 1903. The Conservatives won the first election, beginning an era of Tory ascendancy which lasted until 1916. At the outset, the Conservative government encouraged railway development, resource extraction, Asian exclusion and ‘better terms’ for the province through a ‘Fight Ottawa’ agenda. The Tories were therefore rewarded with ever-larger majorities in the 1907, 1909 and 1912 elections – to the point where, in 1912, the Liberal Party won no seats and two Socialist MLAs formed the official opposition to the Conservative government. This era, however, was suddenly halted in the 1916 election. After Premier Richard McBride’s resignation, the Tory government was hurt by a wartime recession in the province and a resurgent Liberal Party which appealed to the new progressive reform movement (which supported women’s suffrage, prohibition, honest government). The Liberals struck back, taking 36 seats to the Conservatives’ 9 seats in the 1916 election. The Liberals remained in power until 1928. Successive Liberal Premiers pursued a cautious pro-business agenda all the while trying to channel the new progressive wave, in the form of women’s suffrage, alcohol prohibition or attempts to fight patronage. Unlike the Tories before 1916, the Liberal majority in the legislature shrank in both the 1920 and 1924 elections. In 1924, the Liberals lost their majority in the face of an ephemeral ‘Provincial Party’, a curious alliance of dissident Tories (Alexander McRae) and elements of the weak local branch of the United Farmers. The Provincial Party, which denounced corruption and the existing party system, won 24% of the popular vote (but only three seats) while the left (Labour) took roughly 12%. Liberal Premier John Oliver, in office since 1918, lost his seat, as did Conservative leader (and former Premier) William J. Bowser. The high ‘protest’ vote in this election testified to the electoral strength of populism or cynicism in BC politics. An appearance of normality was restored in 1928, when the Conservatives, now led by the inoffensive Simon Fraser Tolmie, swept to victory with 35 seats against only 12 for the incumbent Liberal government. The Conservative victory in 1928 was, ultimately, a godsend for the Liberals because the Tories were the ones in charge when the Depression hit. The Conservatives were both unwilling and unable to counter the Great Depression forcefully, as demanded by most voters, and the Conservatives disintegrated by the time of the 1933 election. Indeed, things had gotten to the point where the Conservative association did not even bother nominating candidates in 1933, leaving incumbents – including Tolmie – to run as independents or under odd labels. In any case, the divided Tories were swept out and the Liberals, led by the reformist Thomas Dufferin Pattullo, returned to power with a large majority government. However, the 1933 election was a watershed because the socialist Cooperative Commonwealth Federation (CCF) became the official opposition, with over 30% of the vote – although only 7 out of 47 seats. With the exception of the 1937 election, the CCF and later the NDP have always formed either the government or the official opposition in the provincial legislature. The emergence of a ‘socialist’ party as the main opposition went on to structure BC politics along the contemporary NDP vs. ‘free-market party’ lines we know today. Pattullo, elected on a platform of “practical idealism” which promised wide-ranging social reforms (new labour laws, welfare, health insurance etc), remained in office until 1941, although his reformist ardour cooled with years in office. He was returned in the 1937 election, which saw the Conservatives reclaim second place for one last time. In large part, this was due to a schism in CCF ranks between Robert Connell, the party’s first leader, and a more radical ‘Marxist’ faction which took control of the CCF in 1936. Robert Connell came from the League for Social Reconstruction, a middle-class group influenced by the social gospel and wary of socialist politics. However, he was toppled by ‘radicals’ with roots in the Socialist Party, which had been strong in BC (but in no other province). The CCF, now led by the more ‘radical’ Harold Winch, reclaimed Official Opposition in the 1941 election. With Pattullo’s Liberal reformism dead on the side of the road (relief payments abandoned, failure to implement medical insurance) and the CCF ascendant, the idea of a Liberal-Conservative coalition to face the ‘socialist threat’ became popular. Pattullo opposed the idea, but he lost that fight to pro-coalitionist Liberals at a 1941 party convention and was replaced by John Hart, who quickly welcomed the Conservatives in his government. The impetus behind the formation of the Coalition was, naturally, the ‘CCF threat’, which was becoming ever more potent. In the 1941 election, the CCF had won the most votes (33.4%) and doubled its seat count from 7 to 14. The Liberals and Conservatives had ended almost evenly matched in the popular vote (32.9% and 30.9% respectively), although the Liberals won 21 seats to the Tories’ 12. However, if the anti-socialist vote remained split, an ever-stronger CCF might realistically be able to win the 1945 election. The LibCon Coalition worked admirably in the 1945 and 1949 elections. In 1945, the CCF increased its support to 37.6%, but because of the coalition arrangement (which won 55.8%), it took only 10 seats against 37 for the coalition. In 1949, the coalition won an even larger majority (39-7) with 61.4% of the vote. Under Hart’s premiership, the province undertook an ambitious program of rural electrification, hydroelectric and highway construction. He was succeeded, in 1947, by Byron Johnson, who instituted a health insurance scheme which quickly fell apart. However, the coalition was undermined by incessant bickering between Liberals and Conservatives after Hart’s retirement in 1947 (and, in 1946, the death of the pro-coalition Tory leader RJ Maitland). Conservative leader Herbert Anscomb favoured the coalition, but he insisted on becoming Premier after Hart’s retirement. The coalition question started dividing the Conservatives, and the Liberals had grown cocky after the success of the coalition in 1945 and 1949. To aggravate matters further, neither the federal Conservatives or Liberals were all that keen on the coalition between their two provincial branches. In early 1952, Johnson fired Anscomb from cabinet, effectively breaking up the coalition. However, to counter the ‘CCF threat’ and ensure that the CCF remained out of power despite the division of the two ‘anti-socialist’ parties, the two parties agreed to a new electoral system – the alternative vote (AV/IRV) – whereby Liberal voters would, the idea held, give their second preferences to a Conservative (and vice-versa) to ensure that the CCF could not win a majority of seats. In a great episode of ‘electoral reform backfiring on the politicians’, the new system allowed a third party – the BC Social Credit League (SoCred) to sneak up the middle, rake up first or second preferences from anti-socialist voters and emerge as the winner. The CCF won the most vote (30.8%) and took 18 seats, while the SoCreds took 27.2% and 19 seats. The Liberals and Conservatives were crushed, with only 6 and 4 seats respectively (on 23.5% and 16.8% support respectively). The BC SoCred, prior to 1952, was a tiny inconsequential movement effectively controlled by the Alberta’s SoCred government. Starting in 1950, the party elected a new leader who purged the troublemakers and cranks, and seized a golden opportunity as the LibCon coalition floundered. The party welcomed two dissident MLAs, including W.A.C. Bennett, a former Conservative MLA who had quit the party in 1951 after two unsuccessful runs for the party’s leadership. After the SoCred victory in 1952, W.A.C. Bennett – who had absolutely no interest (or even knowledge) of original social credit monetary theories – became Premier. The party’s victorious 1952 campaign, however, was controlled by the Alberta SoCred and led by a federal MP from Alberta, Ernest Hansell. The Albertan SoCred movement (elected in 1935) was born out of the social dislocation bred by the Great Depression and represented a populist protest movement (in that it actually believed in the social credit theories it campaigned on in 1935), infused with Christian evangelical and moralistic values. In contrast, the BC SoCreds came to power in a time of relative economic prosperity and it did not promise a radical, Utopist renovation of the whole financial system. After all, the Alberta SoCreds had tried and failed to implement actual social credit policies. Finally, the Alberta SoCreds always retained a strong Christian evangelical/fundamentalist element. While the BC SoCreds had a similar evangelical strain and campaigned using Christian/moralistic rhetoric, it was much less accented than in the Alberta party. The party did, however, perform strongly in regions like Chilliwack, Langley and the Cariboo which have a high percentage of Christian evangelicals. The BC SoCreds exploited widespread disillusionment and resentment with the existing party system, particularly the incessant bickering between Liberals and Conservatives, the corruption in both parties and the generally mediocre record of the coalition governments. In 1952, SoCred had even been able to gain votes from CCF voters, whose distaste of the LibCon coalition exceeded any mistrust of the new right-wing party. Although the BC SoCreds claimed to be a broad, cross-class alliance which was equally as opposed to the “forces of monopoly” than to socialism, the SoCreds quickly became the right-wing ‘free-market’ and anti-CCF/NDP party, albeit one with a more rural and slightly populist electorate. Up until the 1970s, the SoCred received its strongest levels of support in rural areas, while being weaker in (under-represented) urban areas, notably Vancouver or Victoria. After his tiny minority win in 1952, Bennett quickly dissolved the legislature and called an election to win a majority government. Campaigning on the need for a ‘strong government’ and promising only ‘good government’, Bennett’s gamble worked and the SoCreds won a majority with 28 (out of 48) seats and 37.8% support. The Liberals won only 4 seats, the Tories were reduced to a mere MLA. The AV system was quickly abandoned and replaced, again, by FPTP. The realignment of BC politics, with the SoCreds replacing the Liberals and Conservatives as the ‘free-market’ (anti-CCF) party was complete. Bennett’s SoCreds won another five successive election, each time with a large majority in the legislature with the CCF, later NDP, as the official opposition. While the Liberals held on to a rump of support (20% and 2-5 seats in each election), the Conservatives won no seats after 1953 and were dead by the 1960s. Bennett’s twenty-year reign saw a sustained economic boom in the forestry, mining, and energy sectors. The SoCred government maintained good relations with its base – farmers, ranchers, traders, small businessmen and sectors of the middle-classes. On the other hand, his government was an unwavering foe of the unions, and it passed strict labour laws which weakened the power of unions and curtailed union activism (banning secondary boycotts, compulsory arbitration in essential industries). The union movement moved even closer to the NDP and minced no words in denouncing the government’s labour policies, but for the most part, the SoCred government maintained relative social peace in the province, buoyed by prosperity. Notwithstanding its free-market orientation, the SoCred government pursued a fairly interventionist economic agenda. Bennett created a number of important Crown corporations (BC Ferries, BC Hydro), finally finished the BC Rail network, invested significantly in infrastructure (highways, roads), launched major hydroelectric dam projects and advocated for universal healthcare. The government’s policies were popular throughout the BC Interior, where infrastructure development made good politics and created a loyal electoral clientele for the government. Many working-class voters, provided with jobs in a period of economic growth, turned away from the NDP and backed the SoCreds. Meanwhile, the SoCreds did what was expected of them by big business: create a climate favourable to investment, and defend the province from the socialist bogey. Although the relations between business and the SoCreds were not as smooth and amiable as relations between the Liberals/Conservatives and business had been in the past, the anti-NDP business community saw in Bennett and his government the sole alternative to the NDP, and accordingly directed its funds to the SoCreds – in the process, draining both the Liberals and Conservatives of funds. The Bennett government created a myth of ‘fiscal responsibility’ and a ‘debt-free province’, which appealed to right-wing voters. In reality, the ‘debt-free province’ claims were belied by the existence of “two sets of books” whereby the Premier classified the debts of government agencies as “contingent liabilities”. The W.A.C. Bennett era ended in 1972, with the victory of Dave Barrett’s NDP. The NDP won 38 seats (out of 55) and 39.6%, while SoCred support fell over 15 points and left the government with only 10 seats. In large part, the SoCred defeat was due to a sudden resurgence in Conservative support – out of almost nowhere, the PCs took 12.7% and won 2 seats, while the Liberals held their 5 seats. Barrett was an ambitious Premier, whose brief three-year premiership saw a spurt of legislative election unseen since the 1930s. The NDP government expanded the public sector, reformed the welfare system (Pharmacare, minimum income), established a provincial Labour Relations Board, implemented public auto insurance (ICBC, still in place today) and created a land commission to regulate the use and sale of farmland. Barrett’s government was hurt by an economic slump and he was criticized for taking the province from surplus to debt. The NDP’s policies antagonized powerful business groups (insurance, mining companies) and led to a re-polarization of the electorate when the government faced the people in 1975. Although the NDP’s support held steady in the election, winning 39.2% of the vote, the government was defeated as the right-of-centre vote coalesced around the SoCreds, now led by W.A.C. Bennett’s son, Bill Bennett. The SoCreds had been able to attract Liberal and Conservative dissidents to the party, and in the election, the Liberals and Conservatives both saw their support collapse by about 9% each and they were both left with only a single seat. The SoCreds won 49.3% and 35 seats, against only 18 for the NDP. Hence began the second era of SoCred governance in BC. In contrast to his father’s more interventionist policies, Bennett Jr began with a policy of “restraint” which slashed social services, reviewed labour laws, cut spending on education and privatized certain Crown assets. Nevertheless, near the end of his tenure (1986), Bennett oversaw the completion of several megaprojects meant to stimulate the economy – Vancouver Expo86, the Coquihalla Highway and the Vancouver SkyTrain. Bennett was reelected in 1979 and 1983. When he retired in 1986, he was replaced by Bill Vander Zalm, a charismatic but eccentric MLA from the party’s social conservative wing. After 1975, the BC SoCreds’ dominance rested on a tenuous alliance of social and fiscal conservatives, with fiscal conservatives like Bennett dominating the party. Bill Vander Zalm won another term in office for SoCred in the 1986 election, with 49% against 42.6% for the NDP (47 seats to 22). Bill Vander Zalm’s government was quickly embroiled in a number of scandals which badly tarnished his party’s image and led to the collapse of the SoCreds. He was involved in a conflict of interest scandal after he sold his Fantasy Gardens theme park to Tan Yu, Filipino Chinese gambling kingpin. A Chinese-Canadian entrepreneur involved in the deal leaked lurid details of parties and bags of money from Yu to Vander Zalm. The scandal forced Vander Zalm to resign in disgrace in 1991. Unfortunately for the SoCreds’ fate, he was succeeded by Rita Johnston, who was closely associated with the scandal-plagued Premier. 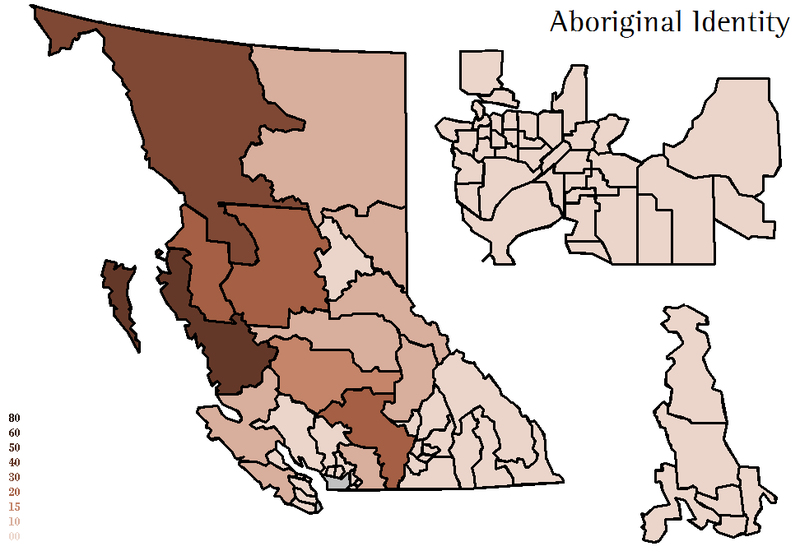 The 1991 election marked another realignment in BC politics. The NDP, led by Mike Harcourt, won a large majority with 51 seats (40.7% of the vote). The SoCreds were decimated, losing half of their vote and falling into third place with a rump caucus of 7 MLAs. In the process, the BC Liberals – which had won all of 6.7% in 1986 and had not won a single seat since 1975 – soared to win 33.3% and 17 seats. Liberal leader Gordon Wilson received a major boost after a strong performance in a debate against Harcourt and Johnston. Unlike the Alberta SoCreds who had taken some time to die off completely after their electoral defeat, the BC SoCreds disintegrated and basically died right after the 1991 election. A splutterign economy in the early 1990s forced Harcourt’s NDP government to move to the right, with the Premier lashing out at “welfare cheats” in a televised address and major cutbacks in welfare. The government also clashed with environmental groups, and, later, a rogue aboriginal group which occupied farmland in the Cariboo (Gustafsen Lake siege). Mike Harcourt was forced to resign in February 1996 after the “Bingogate” scandal, in which an NDP MLA had use charity bingo money for party funding. Harcourt was not implicated and later exonerated, but chose to take full political responsibility. Months before the June 1996 election, Glen Clark replaced Harcourt as Premier. The Liberals, led by Gordon Wilson, proved fairly ineffective as the official opposition after the 1991 election. After revelations that he was having an affair with another Liberal MLA, Wilson was forced to call a leadership convention in 1993. Gordon Campbell, the mayor of Vancouver since 1986, easily won the party leadership while Wilson, who finished a distant third, later quit the Liberals to create the centrist Progressive Democratic Alliance (PDA). Under Gordon Campbell, the party shifted to the right and established itself as the sole centre-right alternative to the NDP. The BC Liberals (as they became known, to further distinguish them from the federal party) actually won the popular vote in the 1996 election, with 41.8% against 39.5% for the NDP. However, the Liberals performed poorly in metro Vancouver and lost some close races in the BC Interior (where they were hurt by Campbell’s promise to sell BC Rail), meaning that they ended up with 33 seats to the NDP’s 39. The Liberals were also hurt by the division of the non-NDP vote: to their right, the Reform Party won 9.3% and 2 seats, while Wilson’s PDA took 5.7% and one seat. The NDP’s second term in office proved to be a disaster which continues to haunt the NDP to this day. Glen Clark’s premiership was marred by a number of major scandals or fiascos. Most prominent among them were the Fast Ferry Scandal and Casinogate. In an effort to revitalize a shipbuilding industry, Clark’s NDP government undertook a fast ferry initiative to upgrade BC Ferries’ fleet with high-speed ferries which would be built locally. The whole affair quickly turned into a mismanaged fiasco, with massive cost overruns, delivery delays and many malfunctioning vessels. In 1999, the RCMP searched the Premier’s house (televised live) in what became ‘Casinogate’ – the Premier was later found guilty (in 2002) of accepting favours (free house renovations) in return for approving a casino application. Following these allegations, Clark resigned in August 1999 and was succeeded, following an acrimonious three-way leadership race, by former Attorney General Ujjal Dosanjh (who had generally been critical of Clark). Ujjal Dosanjh himself was personally popular and the province’s economy was doing well, but he was unable to save the NDP from oblivion (although he did increase its polling numbers from 15% to 21%). In May 2001, the BC NDP suffered one of the worst defeats for any incumbent government in Canadian history, winning only two seats (not including Dosanjh’s seat) and a paltry 21.6% of the vote. Gordon Campbell’s BC Liberals swept to power in a massive landslide, taking 77 seats and a massive 57.6% of the vote. The Green Party, previously marginal, took 12.4% of the vote but it failed to win any seats. Even the Marijuana Party managed to win 3.2% by running a full slate of candidates (cue the BC weed jokes). Gordon Campbell generally governed from the right during his years in office. Upon taking office, he cut the personal income tax by 25% across the board, cut the corporate income tax and eliminated the NDP’s corporate capital tax. To finance tax cuts and balance the books, the Liberal government implemented austerity measures which included reductions in social services and welfare rolls, deregulation, the sale of government assets (the Fast Ferry fleet was auctioned off), reducing the size of the civil service and closing some government offices. One of his most controversial decisions came in 2003, when he reneged on an electoral promise not to sell BC Rail. BC Rail was eventually sold to Canadian National (CN) in November 2003. BC Rail would become a bit like the BC Liberals’ equivalent of Fast Ferry (though far less damaging). Law enforcement quickly uncovered evidence of illegal or improper conduct of various government officials, consultants and BC Liberal insiders. In 2009, it was revealed that a BC Liberal insider had received nearly $300,000 from BC Rail between 2002 and 2004. During his first term, Gordon Campbell suffered a personal embarrassment and a stain on his image when he was arrested for DUI while on vacation in Hawaii. His mugshot was published by the Hawaiian police and he was fined US$913. However, BC’s economy remained strong and the government could boast the best job creation record in Canada. In 2005, the BC Liberals won a second term with a reduced (more ‘normal’) majority, taking 45.8% and 46 seats against 41.5% and 33 seats for the NDP. The Green vote fell to 9.2%. Although some of his environmental policies during his first term were criticized by environmental groups, Campbell’s Liberal government implemented a carbon tax, which is now set at a final price of $30 per tonne of CO2e emissions. Although some on the right opposed the new at the outset, a movement which contributed to the revitalization of the moribund BC Conservatives in the 2009 election, the carbon tax was generally well accepted as the government used revenues to lower corporate and income taxes. Campbell’s Liberals won a third term in 2009, with basically the same results as in 2005: 49 seats to the NDP’s 35, 45.8% to the NDP’s 42.2%. The Greens won 8.2%, while the BC Conservatives put forward a slate of 24 candidates and won 2.1%, doing quite well in conservative ridings in the BC Interior (5-10%, 20.2% in Boundary-Similkameen). Gordon Campbell’s popularity tanked shortly thereafter, when his government announced that it would introduce a Harmonized Sales Tax (HST), a 12% sales tax which would replace the 5% federal GST and the 7% Provincial Sales Tax. Three Atlantic provinces had already introduced the HST in the 1990s, and BC joined Ontario in moving towards the HST in 2010. While the introduction of the HST was met with strong popular opposition in both provinces (because it increased taxes on some items, including gas), BC showed its populist and contrarian streak by rallying behind a petition to repeal the tax, spearheaded by former SoCred Premier Bill Vander Zalm. In Ontario, meanwhile, voters bided their time when the tax was installed. In November 2010, Campbell, facing an imminent caucus revolt over his style and the political backlash from the HST, announced his resignation. In a leadership contest in February 2011, he was succeeded by Christy Clark, a Deputy Premier under Campbell’s first term who became a radio talk show host in 2005. Clark ran as the outsider and populist “families first” candidate, and supported the initiative referendum on abolishing the HST. Clark’s victory was not met with great enthusiasm within her caucus – only one sitting Liberal MLA had supported her; most Liberal MLAs had backed either finance minister Kevin Falcon (the more right-wing candidate) or George Abbott (the more left-wing and rural candidate). In a mail-in referendum in the summer of 2011, BC voters rejected the HST, with 54.7% of voters voting in favour of abolishing the HST and replacing it with the old GST/PST system. Christy Clark enjoyed a short-lived honeymoon with voters in the spring of 2011, leading to speculation that she might call an early election in the summer or fall of 2011 to win a mandate for herself. However, the defeat of the HST in the summer led her to scrap those plans and indefinitely postponed an election call. Liberal support collapsed to the mid-to-low 20s in late 2011 and 2012 as she became widely perceived as an ineffective, even downright incompetent Premier. Clark has been dogged by continuing fallout from the BC Rail scandal, due to her cabinet position at the time and her family connections to people commonly mentioned in the investigations and search warrants at the time. She has suffered from allegations that she participated in the scandal by providing government information to a lobbyist (and Liberal strategist). Her brother was also the subject of one of the warrants, although no charges were laid against him. Having won the Liberal leadership as the outsider against two incumbent cabinet ministers backed by the quasi-entirety of the Liberal caucus, she was never very popular with her caucus and she was constantly at risk of being toppled by a caucus revolt. As it appeared that Christy Clark was a dead woman walking and the Liberals facing oblivion in the 2013 election, leadership rivals Kevin Falcon and George Abbott – respectively finance and education ministers in her cabinet – announced in the summer of 2012 that they would retire at the next election. In March 2013, only a few months before the election, Christy Clark was nearly removed from office by a caucus revolt which followed an ‘ethnic vote’ scandal. Liberal strategy documents detailing the party’s attempts to woo visible minority (Chinese, South Asian) voters, notably by chasing down “historical wrongs” to apologize for (the Chinese head tax, for example), tailoring government policy to “resonate” with the target groups; and “developing a stable” of Liberal loyalists willing to write letters to the ethnic media to peddle the government line. The ‘ethnic vote’ scandal was widely criticized as being extremely insulting and patronizing to ethnic minorities. Under Christy Clark, the BC Liberals have been slightly more centrist, while still continuing to be a coalition of federal Conservatives and some federal Liberals. Clark herself is a federal Liberal, but she has associated with several federal Conservatives and supporters of Stephen Harper. Former federal Tory MPs Chuck Strahl and Stockwell Day publicly endorsed the BC Liberals. The BC Liberal platform said a vote for them was “choosing a balanced budget, a growing economy, small government and low taxes”. The Liberals emphasized ‘controlling spending, balancing the budget and a debt-free BC’, notably through capping spending increases, a debt paydown plan but also a small increase in the tax rate for those earning over $100,000 and raising the corporate tax rate. In the latest budget, the government projected a surplus in 2013/2014, the first since 2008/2009. One of the major issues in BC politics these days is natural resources, notably with the much debated plan to build the Northern Gateway pipeline to transport Alberta’s oil to the port of Kitimat in northern BC, where supertankers would transport the oil to Asian markets. First Nations communities and environmentalists strongly oppose the plan, but the federal government strongly supports it. Clark has been mixed on the issue, demanding an agreement on revenue sharing with Alberta. The Liberal platform supports oil pipelines on condition that they go through the full environmental review process, have a “world-leading” oil spill response plan, meets legal requirements regarding Aboriginal treaty rights (and that First Nations are provided with opportunities) and that BC receives a “fair share” of the economic benefits. However, the Liberal government has been a very strong proponent of fracking for liquefied natural gas (LNG). The Liberals claim that promoting LNG will make the province debt-free and create thousands of jobs. The NDP and some experts think that it is all wishful thinking, contending that LNG won’t generate the estimated windfall and that the Liberals, as they have tended to do in the past, are hyping up the benefits of natural gas. The BC NDP, in opposition since the 2001 election, were the favourites for the entire campaign and most of the run-up to the campaign itself. However, there was generally not a whole lot of popular enthusiasm for either the NDP or its leader, Adrian Dix. Dix became party leader in 2011 after Carole James, the NDP leader since 2003 who had led the party in the 2005 and 2009 elections, was pushed out of the position by a caucus revolt in late 2010/early 2011. Adrian Dix, Glen Clark’s former Chief of Staff and MLA for Vancouver-Kingsway since 2005, defeated three other candidates for the BC NDP leadership. He was considered as being the most left-wing candidate in the field. In his leadership bid, Dix supported eliminating the HST, rolling back reductions in the corporate tax rate, supporting the redirection of carbon tax revenue to pay for public transit, increasing the minimum wage to $10 (which has since been done by the Liberal government), creating a provincial child care system, restoring grants to the post-secondary students, reducing interest on student loans and restoring the corporation capital tax on financial institutions. The BC NDP’s platform focused on the notion of “change for the better”. It emphasized, besides obligatory job creation, reducing child poverty and inequalities, improving care for seniors and fighting climate change. It promised a $210 million BC Family Bonus to help over 300k low and medium-income families with children and to increase welfare payments (an increase of $20 a month). Claiming that the Liberals have rolled back basic employment rights, the NDP promised to “strengthen and enforce employment standards” – notably by indexing the minimum wage to inflation. The NDP also supported lowering tuition fees, while the Liberal government only promised to limit tuition fees increase to a maximum of 2%. The BC NDP opposed the Northern Gateway pipeline, as well as Kinder-Morgan’s plan to twin its existing Edmonton-Burnaby Trans Mountain pipeline. It supported a ‘made-in-BC’ environmental review process, a strategy for sustainable energy and more action on climate change. The NDP remains a polarizing party, which has a strong base of support but also a motivated opposition. The BC NDP has struggled to fully dissociate itself from the NDP governments in the 1990s and the corruption scandals (Fast Ferry and Casinogate) from that era, and it also has always received a bad rap as being in cahoots with labour unions. The Liberals constantly criticize the NDP for being unable to “stand up” to its “friends” in labour, and its “reckless spending” policies. In an attempt to appeal to middle-ground swing voters, Adrian Dix tried to lead a campaign which was widely described as “boring” and vaguely centrist. He refused to go negative on the Liberals and ran a ‘positive campaign’, which critics claim didn’t do a good job of holding the Liberals to account for their record and failures in office. The Greens have been a strong third party in BC politics since they won 12% in the 2001 election, although their support has fallen off since that high (returning to more ‘normal’ levels after the 2001 aberration). However, the Greens have never won a seat in the legislature. Unlike, say, the Ontario Greens, the BC Greens are a left-wing party, leading many Dippers say that they don’t serve much of a purpose because of their ideological proximity to the NDP. While it is true that the Greens and NDP are rather similar ideologically, and most Green voters would probably prefer an NDP government in Victoria to a Liberal government, there are some differences. The Greens tend to place more emphasis on green issues, notably a ‘sustainable economy. The Greens support a balanced budget, achieved by “ending corporate welfare, eliminating subsidies to polluting industries and fair taxation policies”, while supporting tax credits or tax cuts for green business practices or green industries. Like the federal party, the Greens want to reduce greenhouse gas emissions by 80% below their 1990 level by 2040. It should come as no surprise that the Greens strongly oppose Northern Gateway and Kinder-Morgan. The Greens got some attention for unambiguously supporting decriminalization of marijuana. While the Greens managed to run full slates in the last elections, they only ran 61 candidates (for 85 seats) this year. Like the federal Greens did in the 2011 federal election (with the success that we know of), the BC Greens seemingly decided to concentrate their rather sparse resources on a few ‘winnable’ ridings (most on Vancouver Island, around Victoria and Elizabeth May’s Saanich-Gulf Islands federal seat) while forgoing weaker regions (notably the Interior or northern BC). Green leader Jane Sterk stood against NDP MLA Carole James in Victoria-Beacon Hill, but the Greens focused a lot of their resources on Oak Bay-Gordon Head, a Liberal-held riding in suburban Victoria where their candidate was Andrew Weaver, a prominent climate modeler at UVic and a member of the Intergovernmental Panel on Climate Change which shared the 2007 Nobel Peace Prize with Al Gore. The BC Conservatives have basically been either totally irrelevant or on life support since the 1952 election, despite short-lived revivals in the 1963 and 1972 elections. The Conservatives lost their last seat in the Legislative Assembly in the 1979 election, and while they have run the bare minimum of candidates in every election since then to maintain their registration, they polled less than 1% in every election between 1983 and 2009. Most federal Conservative voters are quite content with supporting the BC Liberals provincially, leaving the BC Conservatives with only a tiny base of supporters – mostly very right-wing voters in the BC Interior who haven’t liked the Liberals for things like the carbon tax, or, more recently, the HST. The Conservatives managed to run 24 candidates in 2009, and took 2.1% province-wide. The Conservatives were left leaderless until May 2011, when former federal Tory MP John Cummins won the party’s leadership. With the HST furor, the HST’s debacle and the collapse of Christy Clark’s short-lived honeymoon, the BC Conservatives surged in polls – reaching heights of 20-23% and often lingering in the high teens. In early 2012, the BC Conservatives came threateningly close to the BC Liberals – either just behind or tied with them. As Christy Clark was seen as a dead woman walking, many started talking about a potential 1952/1991-like realignment of BC politics with the Conservatives potentially displacing the Liberals as the “free-market” and anti-NDP party. A Liberal MLA and former cabinet minister, John Van Dongen, joined the Conservatives in March 2012. Unfortunately for the Conservatives, Cummins alienated several members of the party and the party was crippled by infighting and legal problems in mid-to-late 2012. John Van Dongen left the party to sit as an independent in September, other members left the party and the party’s polling plunged to the low 10s or even high single digits (benefiting the Liberals). The BC Conservative platform – “we believe in BC” (I would love to see a campaign focusing on “we really don’t believe in [our country]”) – was vague, aimed mostly at appealing to conservative voters in the BC Interior – it lamented rural depopulation, immigration to urban areas and lashed out at the carbon tax (they’re the only party which supports abolishing it). The Conservative platform talked a lot about a balanced budget, and its platform included promises for lowering corporate and income taxes. But in general, a lot of its ‘plan’ was vague and focused on criticizing the Liberals and NDP for budget woes. Kyle Hutton from Blunt Objects (who did a great guest post for me on Labrador) talked about the Conservative platform here. He described it as terribly boring, with most of it consisting of blurbs which read like Wikipedia articles. The Conservatives nominated 56 candidates. They lost a few candidates, notably in Boundary-Similkameen (where they won over 20% in 2009), because of moronic comments they made. John Cummins ran in Langley, a conservative suburban riding in the Lower Mainland with a strong Christian evangelical base. The party didn’t really recruit star candidates, except maybe one or two former federal Tory MPs (which most people wouldn’t actually know/remember, I’d wager). The results – what on earth was that? NB: Coquitlam-Maillardville is wrong, after a final count the NDP won the seat by 5 votes. The BC election on May 14 was one of the most shocking upsets in recent Canadian political history (up there, of course, with Alberta’s 2012 election) – and perhaps even the whole world. The BC Liberals hadn’t led in any opinion poll for two years (since May 2011), and the BC NDP led in all polls during the campaign. The last polls before the election had placed the BC NDP at 45%, with its lead generally ranging from 6% to 14%. The only poll which showed a close race, a Forum Research poll released on May 8, showed the BC NDP holding a two-point lead over the Liberals, 43% to 41%. The BC NDP’s lead over the Liberals had shrunk over the course of the campaign, coming out the gates holding a nearly 20 point lead (with the NDP nearing 50% and the Liberals lingering below 30%). During the course of the campaign, the BC Liberals had managed to move out of the high 20s into the 30s, but they never came within striking distance of first place in any poll besides Forum Research’s May 8 poll. On average, according to the final polls, the NDP was between 44% and 46%, while the BC Liberals were between 36% and 38%. The Greens, on average, at their 2009 levels (7-9%) although some polls had them higher (13-14%). The Conservatives, finally, saw their support in the final days range between 5 and 8%. Based on these polls and the NDP’s consistent and comfortable lead therein, everybody predicted that the NDP would win a solid majority. Instead, the Liberals won the election by 4.9% and won the same number of seats as in 2009. A major upset which, in many aspects, appears quite similar to the Albertan provincial election last year, in which the incumbent PCs won by 9% after the polls and everybody had predicted that the upstart Wildrose Party would win a solid victory. In both cases, the polls ended up dead wrong – nobody predicted the correct winner. That makes for a pretty bad record for Canadian pollsters in the past years. In the 2011 federal election, almost all of them failed to predict that the Conservatives would win a majority government rather than a minority. In Alberta, no pollster correctly predicted the outcome of the election and they all showed the Wildrose ahead (Forum Research, again, came closest, when they showed the Wildrose up only 2 points, rather than 5-10). In Quebec’s provincial election last September, while the pollsters were not wrong on the outcome (PQ victory) they basically all failed to foresee the incumbent Liberals, widely seen to be at risk of falling into third place, coming so close to eking out an upset victory. And now, in BC, no pollster correctly predicted the outcome. In general, the BC NDP was overestimated by 3.5 to 5.5%, while the Liberals were underestimated by about 7-8% on average (except Forum). There are a number of factors and reasons which explain why the Liberals were able to pull of such a shocking upset, but few of those reasons explain why the pollsters failed so badly. The BC Liberals ran the best campaign, and the the NDP ran a mediocre campaign at best. Adrian Dix’s decision to run a ‘positive’ campaign, refusing to engage in negative tactics against the Liberal government, made the NDP campaign a boring affair. Dix went out of his way to reassure swing voters that the BC NDP was a moderate, centre-left party which stood for the vague notion of “change for the better”; rather than something similar to the NDP of the 1990s, associated with corruption and mismanagement by a lot of BC voters. When he wasn’t doing that, he was running a policy wonk campaign which tried to explain the intricacies of his party’s long and detailed platform to voters. In the process, he managed to lose everybody’s attention. In contrast, the Liberals successfully went on the offensive against the NDP, painting them either as “reckless spenders” who would throw the province into debts and deficits like in the 1990s or a party in cahoots with “big labour” and “environmental lobbies” who would oppose natural resource development (hence, opposing ‘job creation’). The Liberals doubled down on the province’s robust economy and the job opportunities which could be created by promoting resource development (first and foremost, LNG). They promised “strong leadership”, in opposition to Adrian Dix who became perceived as either too weak or an unknown quantity. Ironically, the NDP allowed their opponents to gain the edge on leadership when Dix, during the campaign, came out against the Kinder-Morgan expansion, after having held ambiguous positions on it beforehand. Many voters, especially in the Interior, extrapolated from this that the NDP would block resource development of any kind and would oppose ‘job creation’ if environmental groups opposed it. Another factor which contributed to the BC Liberal victory was the low support for the BC Conservatives. They won 4.8%, which is the best result for the Conservative Party since the 1970s, but well below what even the final polls had predicted (6-8%). Some right-leaning voters likely hesitated between the Liberals and Conservatives until the last minute. The BC NDP wins when the right is divided, and it loses when the right is united. In 1972, the PCs went from 0.1% to 12.7%, stealing a substantial amount from the SoCreds and allowing the NDP to win. In 1975, when the Conservative and Liberal vote collapsed, the NDP lost. In 1991, the anti-NDP vote was split between the Liberals (33.3%) and the SoCreds (24.1%), allowing the NDP to win – incidentally, the NDP did worse in 1991 than in 1986 (a two-party contest which they lost). In 1996, although the BC Liberals established themselves as the sole ‘free market’/anti-NDP alternative, the right-wing Reform Party won 9.3% and Gordon Wilson’s centrist PDA (5.7%) likely took some votes which would otherwise have gone to the Liberals. This year was no different. If the Conservatives had won over 10% of the vote, then the NDP would have won in a landslide. If they had done only a bit better, polling in the 7-9% range, the NDP would probably have managed to win a narrow majority. However, the Conservatives ended up being inconsequential. The Liberals are lucky that the BC Conservatives had their 15 minutes of fame in 2011 rather than in 2013. They are also lucky that the Conservatives were unable to capitalize on their brief surge in 2011/early 2012. Instead of recruiting prominent candidates in every riding and developing a coherent set of policies which would appeal to BC Liberal voters, the Conservatives were caught up in leadership woes with a leader who alienated several members of the party; they also failed to recruit good candidates and they failed to put up a full slate, they mostly recruited the usual motley of cranks and nobodies. Ipsos-Reid released an ‘exit poll’ which had correctly predicted the result on election day (see press release, or full doc with crosstabs), which gives some interesting insights into the reasons for the BC Liberal’s victory. 51% of voters decided during the course of the campaign, including 23% who decided on the day of (11%) or during the last week (12%). The Liberals won those voters who decided during the course of campaign: 9% of their voters decided to vote for them on election day, and overall 55% of their voters decided during the campaign. In contrast, 58% of the BC NDP’s voters had made up their mind before the campaign. The BC Liberals ran the best campaign, the one which convinced the most late-deciders. The BC NDP’s campaign was all about “change”, but only 40% of voters said that “a desire for change” was a ‘very important’ factor in their vote. 41% of voters said it was not an important factor. NDP voters embraced the change message by a wide margin (74%) over other parties, but it did not translate amongst other voters. Instead, voters said their top issues were an ‘open and honest government’ (71% rated as ‘very important’), the economy (65%), healthcare (60%), trust in a leader/party (58%), government spending (56%) and leadership (56%). The BC Liberals had a huge advantage among voters who rated the economy and government spending as ‘very important’ – a 24 point margin over the NDP on the economy, and a 20 point margin on government spending. During the campaign, Ipsos-Reid’s polls had found that the governing party only had a small edge on those issues (+7 and +2 respectively). Premier Christy Clark had a 10 point margin over Adrian Dix on the ‘best Premier’ ratings, reversing Dix’s 13 point lead before the election. The NDP won voters whose top issues were healthcare, trust or an ‘open and honest government’. However, on the issue of trust – which the BC NDP had tried to push during the campaign – the NDP only had a 5 point margin over the Liberals. The exit poll also shows that the BC Liberals were smart to focus on the province’s current economy, because BC voters are optimistic about the province’s direction. 51% of all voters, and 84% of Liberal voters, said that BC was on the ‘right track’ against only 32% who thought the opposite. By playing on voters’ satisfaction with the state of their province’s economy, the Liberals found a successful vote-winner. One extremely relevant point in this discussion, which also relates to the pollsters’ failure, is the composition of the electorate – particularly as it relates to age. Turnout was 52%, but low turnout does not explain why the polls sucked – turnout was the same in 2009, but the polls had that election correct. The electorate which turned out to vote on May 14 was older, whiter and more small-c conservative than the actual electorate. For example, the exit poll’s sample had voted 50% Liberal and 32% NDP in the 2009 election (and 43% Conservative, 25% NDP and 20% Liberal in the 2011 federal election) – a considerably more conservative electorate than the actual 2009 or 2011 electorate. BC NDP voters, particularly their oft-unreliable younger supporters, were likely complacent and felt so certain that the NDP would win that many did not bother voting. According to the exit poll, 48% of voters expected that the election would result in a NDP majority (75% of NDP voters thought their party would win a majority) and only 11% said that the BC Liberals would win a majority (only 23% of Liberal voters thought their party would win as they did). The ‘certainty’ of the BC NDP’s ‘victory’ demotivated NDP voters, but it also – and this could arguably be quite surprising (‘why vote for a lost cause?’) – motivated Liberal voters to turn out, perhaps in the hopes of saving a local MLA or ensuring that the Liberal defeat was not too severe. One of the main explanations (but not the only one) for the pollsters’ failure is that they did not correctly predict the composition of the electorate. However, Ipsos-Reid’s poll show that there was some late shift with a significant part of the electorate which no pollster was able to pick up. The BC Liberals, as mentioned above, increased their support among all age groups compared to Ipsos-Reid’s last poll. It is quite possible that polls were underestimating the Liberal vote, either because of a shy Liberal effect or the more widespread “unpopular governments underpolling” effect which comes up in all elections with a long-time and/or unpopular incumbent government facing reelection. But that can only be a small part of the explanation – unless the shy Liberal/unpopular government effect was huge, which is unlikely. The Liberals did not overperform their polling numbers by 1-3 points, but by a much larger amount. 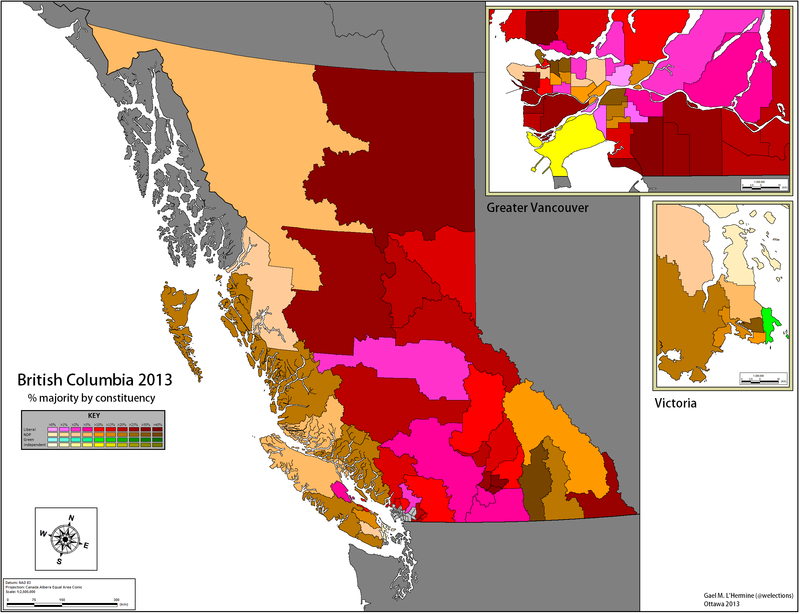 The broad contours of BC’s provincial electoral geography remained largely the same. The BC Liberals were strongest in the rural and conservative regions of the BC Interior and northern BC, the conservative suburban Fraser Valley, the affluent parts of the Greater Vancouver area, the heavily Chinese suburban city of Richmond and the affluent retirement-oriented communities on Vancouver Island or Okanagan (Kelowna and surroundings). The BC NDP were strongest in Vancouver’s deprived Downtown Eastside or the city’s more trendy neighborhoods, parts of the lower-middle or working-class suburbs of Greater Vancouver (Burnaby, New Westminster, Port Coquitlam), the heavily South Asian (Punjabi) parts of Surrey, Victoria, most of Vancouver Island, the remote ‘left coast’ of mainland BC and parts of the Kootenays in the Interior (a mix of old unionized small working-class towns, hippie/countercultural areas around Nelson and a pacifist religious influence in the past from the Dhukobor). The BC NDP performed relatively well in Vancouver (city proper), which is the only region in the province where they did better than in 2009. Most strikingly, NDP candidate David Eby defeated Premier Christy Clark in her Vancouver-Point Grey riding, with 47.3% against 43.7% for Clark. Vancouver-Point Grey had been former Premier Gordon Campbell’s riding between 1996 and his resignation in 2011, and Christy Clark (originally elected in the Port Moody/Coquitlam area) returned to the legislature as Premier following a by-election in Vancouver-Point Grey in May 2011. Campbell had won his seat by ten points over the NDP in 2009, but Clark had won the by-election by only 3.5% in May 2011 – an embarrassingly close result. Vancouver-Point Grey includes part of the federal riding of Vancouver-Quadra, which is held by the federal Liberals. Provincially, the BC NDP tends to be quite strong in the Kitsilano portion of the riding, a fairly trendy neighborhood. The very affluent West Point Grey portion of the riding is solid Liberal turf provincially. The NDP also gained the riding of Vancouver-Fairview, defeating incumbent Liberal cabinet minister Margaret MacDiarmid. The riding is socially mixed area, combining NDP-leaning lower-income areas with solidly Liberal affluent neighborhoods (Shaughnessy). The Liberals, however, held Vancouver-Fraserview, a marginal riding in southeastern Vancouver with a mixed Chinese and South Asian population. The Liberals resisted pretty strongly in Vancouver’s suburbs. The NDP gained Burnaby-Lougheed, meaning that the NDP now holds all but one seat in the Burnaby/New Westmister area, a largely middle-class suburban area. However, the NDP largely held what it already had in the area – it failed to pick up low hanging fruit like Burnaby North. The NDP has ultimately managed to hold Coquitlam-Maillardville, winning the seat by a mere five votes after the final count including absentees. The BC Liberals regained Port Moody-Coquitlam, which it had lost to the NDP in a 2012 by-election. In Vancouver’s affluent northern suburbs, the Liberals comfortably held all their seats (albeit with reduced margins), even the most marginal of them, North Vancouver-Lonsdale. The Liberals held all three seats in the heavily Chinese suburb of Richmond, although the Conservatives did relatively well in two of three seats. In Delta, independent MLA Vicki Huntington, who had won the seat by a hair in 2009 against the unpopular Liberal Attorney General Wally Oppal was reelected by a much stronger margin, over 10 points. The Liberals picked up Delta North, one of the biggest swings of the election – the NDP had won the seat by 9 points in 2009. The results in Delta North are similar to those in Surrey, a suburban area with a large South Asian population, which had one of the biggest swings against the NDP. The Liberals picked up, surprising everybody, Surrey-Fleetwood, a safe NDP seat which the NDP had won by 11 points in 2009. The Liberal vote share increased pretty significantly in the heavily South Asian NDP seats in central Surrey: +4% in Whalley, +11 in Green Timbers (the NDP vote fell by almost 15%!) and +12 in Newton. In the whiter affluent parts of Surrey, traditionally Liberal seats, the Liberal and NDP votes barely budged from 2009. These results (along with Delta North, which has a large South Asian population) indicates that the South Asian vote, which had been solidly Dipper in 2009, swung pretty significantly towards the Liberals. A fairly puzzling shift, especially taking into account the outrage surrounding the Liberals’ ‘ethnic vote’ blunder earlier this year. The Liberals swept the Fraser Valley, a conservative suburban/exurban region with a strong Christian evangelical base (especially around Langley, Abbotsford, Chilliwack). The Liberals held their safe seats in Langley, Abbotsford and Chilliwack – notably defeating Conservative leader John Cummins in Langley, where he won only 11.8%. Conservative candidates in the other Fraser Valley ridings won about 8-9% on average. The Liberals picked up Maple Ridge-Pitt Meadows from the NDP, and regained Chilliwack-Hope, a seat they lost to the NDP in a 2012 by-election (in good part because the Conservatives had won 25%, they won only 10.9% this year). The BC Interior is a traditionally conservative region, politically influenced and driven by alienation to the dominant Lower Mainland/Greater Vancouver. 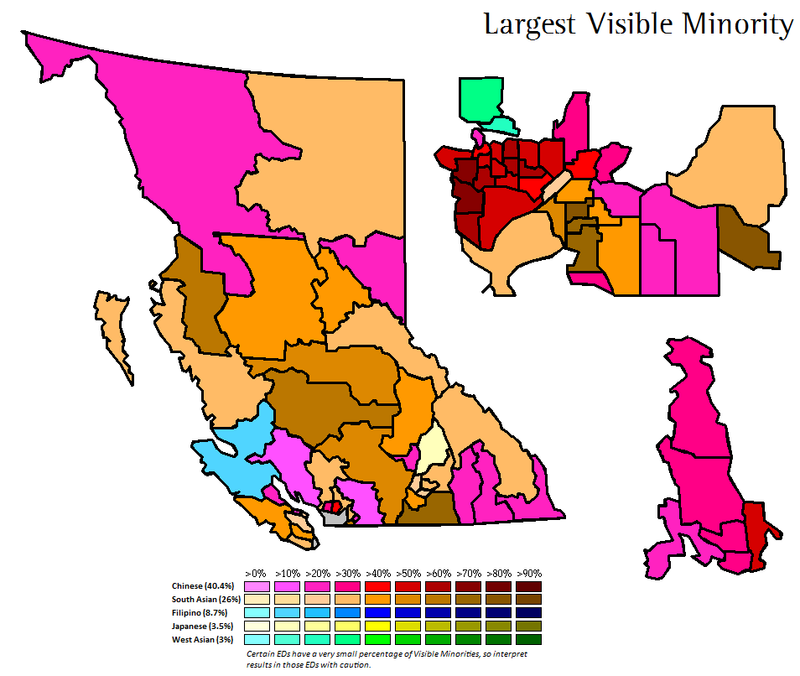 However, the NDP has always had a fairly significant base of support in certain parts of the Interior – old unionized resource-based working-class towns (old mining communities, mill towns) or, more recently, hippie or countercultural settlements (oftentimes in the mountains, see the Slocan Valley). This year, there was a significant swing against the BC NDP in the Interior, and the Liberals did very well, especially taking into account Conservative competition. The Liberals gained Fraser-Nicola from the NDP, taking the seat with a hefty 6% margin over the NDP incumbent. In Cariboo North, the Liberals defeated the NDP-turned-independent incumbent, largely due to a vote split between the ex-NDP incumbent (37.3%) and the NDP candidate (21.5%) which allowed the Liberals to sneak up the middle and win. The Liberals held all their vulnerable seats, such as Kamloops-North Thompson, Vernon-Monashee, Boundary-Similkameen and Penticton. Theoretically, the BC Conservatives should have been at their strongest here (they were, in comparison to other regions) but even here they remained inconsequential in the broader scheme of things. Conservative candidates in the Kelowna/Vernon area in the Okanagan barely improved (if at all) on the Conservative results in 2009 (10-12%). In Boundary-Similkameen, their strongest result in 2009, they did not even run a candidate (their original candidate, Mischa Popoff was dropped when he turned out to be a crazy misogynist). Overall, the Conservatives were nothing more than an inconsequential irrelevance this year. They did not split the vote and allow the BC NDP to win many seats from the Liberals, and they had only a limited impact – at best – in regions where they should poll well (Fraser Valley and the Interior). The Conservatives are stronger today than at any point since the 1970s, but they still have a lot of work to do before they become a force to be reckoned with. They need to win a strong leader, preferably somebody who is quite well known, but besides retired Reform and Tory MPs, it is hard to see who could fill that role. They need to develop policies which don’t read like a Wikipedia article, and which seek to appeal to a broader electorate than just angry right-wingers in the BC Interior. Finally, they need a strong organization which can actually vet candidates properly (something which they absolutely did not do this year) and run a full slate. These things are tough to do, and even if you do them, you’re not guaranteed success – ask the Greens. For the time being, the Conservatives will not be a realistic alternative on the right to the Liberals. Nothing really changed in northern BC, except a small drop in the NDP vote from 2009. The Conservatives had their best result in Peace River South, where they placed second behind the Liberals with 27.3%. In Vancouver Island, the main story was the success of the Green Party – throughout the island, the Greens took about 17% of the vote, most of that coming from the Greater Victoria area, where the Greens won about 27% and won their first ever seat in the BC legislature – Andrew Weaver, the climate scientist, won Oak Bay-Gordon Head with a 10 point margin over Liberal incumbent Ida Chong. The BC Liberals held their two other seats on the island, Comox Valley and Parksville-Qualicum with little trouble. Both of these seats include affluent seafront communities, which are particularly attractive to retirees (notably Qualicum Beach). The Liberals came close to a win in the Cowichan Valley. The Green Party performed extremely well in the whole Victoria and Gulf Islands region. In Oak Bay-Gordon Head, a well-educated and fairly affluent riding in suburban Victoria, Green candidate Andrew Weaver won 40.1% against 29.7% for Liberal incumbent Ida Chong and 28.3% for the NDP. Like federal Green leader Elizabeth May did in Saanich-Gulf Islands in the 2011 federal election, the BC Greens heavily targeted the riding and invested a lot of their resources into it. In the process, they managed to coalesce a broader coalition of voters which took votes away from both the Liberals and NDP (in roughly equal amounts). The Greens came close to winning a second seat in Saanich North and the Islands, a Liberal-held seat which ended up as a three-way race. The NDP won 33.2% against 33% for the Liberals and 31.9% for the Greens. The Liberals tend to perform well in Sidney and the mainland, a fairly affluent region home to a large senior population. The Gulf Islands, however, are a major artsy/hip/countercultural (Vietnam draft dodgers) hotspot and are solidly left-wing – in 2013, they likely split their votes between the Greens and the NDP. The Greens also did well in other seats in the Victoria region: 33.7% for Green leader Jane Sterk in Victoria-Beacon Hill, 22.6% in Victoria-Swan Lake, 21.6% in Esquimalt-Royal Roads, 15.2% in Saanich South, 15.5% in Juan de Fuca and 18.8% in the Cowichan Valley. In all cases, the Greens seemingly took an equal amount of votes from the NDP and the Liberals, perhaps taking a bit more from the NDP in some ridings (in Victoria). It is interesting to point out that the Greens’ strongest performances came in ridings which are part of the federal ridings of Saanich-Gulf Islands or Victoria at the federal level – the former is Elizabeth May’s stronghold, the latter had the federal Greens winning 34.3% and coming within 3 of gaining the seat (from the NDP) in a federal by-election in November 2012. Has the federal Greens’ strong infrastructure and organization efforts in those two federal ridings transferred over to the provincial level? It is quite likely, especially given that the provincial and federal Green parties tend to cooperate closely with one another. Throughout the province, the Greens won 8%, which is down a bit on their 2009 results (which weren’t that great compared to 2001 or 2005). A lot of those 8% came from Vancouver Island and Victoria. However, it is worth keeping in mind that the Greens only ran 61 candidates, instead of a full slate like in 2005 and 2009. In some seats in the Kelowna region where the Greens had done quite well in 2009, they had no candidates this year. If we were to take only seats where the Greens ran candidates in both 2009 and 2013, the Greens likely performed slightly better this year than in 2009. There are, of course, a few exceptions – the Green vote dropped from 22.2% to 11% in West Vancouver-Sea to Sky, a riding which includes the Green-friendly ski resort of Whistler and the trendy Bowen Island. On the other hand, the Greens managed to win 20.8% in Nelson-Creston, a safe NDP seat in the Kootenays. What a fascinating, surprising and eventful election. There are so many things to take out of the results. Pollsters will have work to do, after totally missing the train with the Alberta and BC elections (and Quebec, to a lesser extent). Where their weightings flawed? Did they incorrectly model the election day electorate? Was there a last minute swing against the NDP and/or to the Liberals? Did expectations of an NDP victory depress NDP turnout and boost Liberal turnout? Did undecideds break heavily for the Liberals? Was it a shy Liberal effect, or the usual case of an unpopular government outperforming polling numbers? Is it a question of methodology (phone vs IVR vs online)? On that last point, while phone pollsters did ‘best’ in BC, online panels should not be dismissed out of hand. Some online pollsters like Angus-Reid have a good track record – they totally nailed some recent provincial elections. Pollsters will need to answer these questions and adjust their work accordingly. The next election in Nova Scotia will see less polling than BC, meaning that the major pollsters will have until a 2014-2015 election in Ontario, an early election in Quebec or the 2015 federal election to fix their methods. The BC NDP will be trying to find out what went wrong for them, how they managed to pull defeat from the jaws of victory. By the time the next BC election comes in 2017, the NDP will have been in opposition for 16 years. Their vote share has decreased in every election since 2005, and they have basically held the same number of seats since then. Adrian Dix is staying on for now, but I have little doubt that he won’t lost for very long – he certainly won’t live to fight another election as NDP leader, after this disastrous election. This election loss isn’t entirely his fault, but he is definitely responsible for a good part of what happened. He led a boring and uninspiring campaign running on a vague and empty promise of “change for the better” which did not motivate anybody besides NDP voters. Surprisingly, Christy Clark, who had been – at best – out of her depth as Premier since 2010 (only a few months ago, she had approval ratings in the mid 20s and disapprovals well over 60), turned out to be a strong and effective campaigner who put the NDP on the defensive (when it should have been on the offensive against a longtime unpopular government). Voters began to appreciate her in comparison to her rivals and a lot ultimately preferred “the devil they knew” against what the Liberals had managed to paint as a risky alternative – reckless tax-and-spenders who opposed ‘job creation’ (without forgetting the NDP’s toxic record from 1991 to 2001). On the right, the substantial number of right-wingers who weren’t too hot on the Clark Liberals and who had flirted with the Conservatives in 2011-2012, ultimately decided to go with the devil they knew. John Cummins turned out to be irrelevant at best. As such, this election could be seen more as a rejection of the NDP (and Conservatives, I guess) and less as a mandate for the Liberals’ governing agenda. The exit poll showed that a majority of voters (58% if I remember correctly) felt that the BC Liberals did not deserve to be reelected. This election proved that negative campaigning does work. “Staying positive” and taking the high road is admirable and it’s all really nice, but it has been shown time and time again that negative campaigning does work, even if voters insist that they don’t want it. The Liberals ran a negative campaign, targeting the NDP. It worked. The NDP and Dix took the high road, stayed positive and found themselves unable to counter the Liberals’ attacks. It didn’t work. It might be a sad reflection on our politics that negative rather than positive campaigning works, but that’s reality. In politics, reality is rarely pretty. On the policy front finally, this election provides an unexpected boost for energy/natural resource companies. Business, particularly energy/natural resources companies with a stake in natural resource development in BC (Enbride and Kinder-Morgan) welcomed the BC Liberals’ reelection. An NDP victory would have meant a much tougher time for pipelines and natural resource development in the province. Business will find it much easier to deal with a Liberal government. Christy Clark is a strong proponent of LNG development, which the Liberals – rightly or wrongly – presented as the solution to the province’s debt and a magic job creator. She is a bit more resistant on pipelines, having set five immovable conditions (see the section on the BC Liberal platform), but she will certainly be much easier to convince (and work with?) than Adrian Dix. The very controversial Northern Gateway pipeline project, for example, cleared an hurdle here. At the very least, the BC election showed us that elections can still be exciting – even when all seems set in stone. I hope this long post was well worth the long wait. Next: I want to include something on the midterm elections in the Philippines held earlier in May, time permitting. Three federal by-elections were held in Canada on November 26, 2012. These three by-elections were to fill vacancies in the federal constituencies of Durham (Ontario), Calgary Centre (Alberta) and Victoria (British Columbia). Durham is a large exurban constituency east of Toronto which includes the municipalities of Clarington, Uxbridge and Scugog (plus a small first nations community). Major communities include Courtice and Bowmanville, two major towns along the 401 east of Oshawa, and the smaller towns of Uxbridge and Port Perry in the north of the riding. Durham is nearly homogeneously white (95%) and predominantly Protestant (52.5%). There are some local industries and employers in the constituency, including a nuclear power plant in Darlington, but the demographics of the constituency reflect a largely exurban population, which commutes to work in Oshawa or Toronto. The constituency has a large percentage of married individuals (57.2%, 31st in Canada), a lower percentage of people aged over 15 (79.9%), a fairly high median household income ($77,210 – 19th in Ontario) but a fairly low percentage of highly educated residents (12.7% of residents have a university certificate or degree) and a very high proportion of homeowners (88.2%). Only 22.5% of residents work in the municipality where they live, the 9th lowest in Ontario. White, English and Protestant, Durham has historically been fairly Conservative. The Uxbridge and Scugog (Port Perry) areas, historically part of Ontario County, have a Liberal tradition while parts of former Durham County were more Conservatives. The Tories won handily in 1988, but throughout the 90s (from 1993 to 2004), the Chrétien Liberals held the seat with comfortable majorities although only because of the division of the right. The Liberals never won over 50% of the vote, and in all three elections the combined right-wing vote was higher than the Liberal vote. In 2004, Conservative journalist Bev Oda regained the seat, earning a small 2.5% majority over the Liberals. With the slow collapse of the Liberal Party in the exurban GTA in 2006, 2008 and 2011 Oda was reelected with larger majorities -17% in 2006, 31% in 2008 and 33% in 2011. In 2011, the NDP – which had placed fourth behind the Greens in 2008 – placed a distant second, ahead of the Grits. Oda, who served as Minister for International Cooperation in the Harper government between 2007 and 2012, was compelled to resign in June 2012 after ethics scandals (in 2011, she had directed staff to add a handwritten annotation to a CIDA memo which resulted in a funding request from an NGO being ignored; in 2012, at a conference she turned down staying at the conference hotel and preferred a more costly hotel). Oda won every poll in 2008 and she lost only one poll in 2011 (a mobile poll covering seniors’ residences). The Tories tend to perform best in the more rural parts of the riding, while the Liberals and NDP find some stronger support in urban areas – especially Courtice and Bowmanville, where the NDP broke 30% in a few polls in 2011 (including, interestingly, some newer middle-class subdivisions). The Liberals, in 2011, performed best in Uxbridge. The Conservatives nominated Erin O’Toole, a local lawyer whose father is the incumbent PC MPP for Durham. The NDP unearthed a strong candidate, Larry O’Connor, the former mayor of Brock (a township which is outside of the riding) and a NDP MPP for the area between 1990 and 1995. The Liberals renominated their 2011 candidate, Grant Humes, while the Greens nominated Virginia Mae Ervin, who had run in 2006 and 2004. The Tories held Durham with a large, although slightly reduced, majority, as was expected. Turnout was 35.8%. The results in Durham are good for the Tories, who broke 50% and especially for the NDP, which maintained and improved on its second place showing in the riding. Prior to the Orange Crush in 2011, the NDP could only dream of finishing second in a riding like Durham (although it did have a few good results in the 70s and 80s). The next NDP breakthrough obviously won’t come from the exurban GTA, which remains a wasteland for the NDP; but that such ridings which had previously been Tory-Grit battles are becoming Tory-NDP places is good news for the NDP. Calgary Centre covers downtown Calgary south of the Bow River. Major neighborhoods in the riding include the Beltine, Mount Royal and some surrounding suburban neighborhoods. 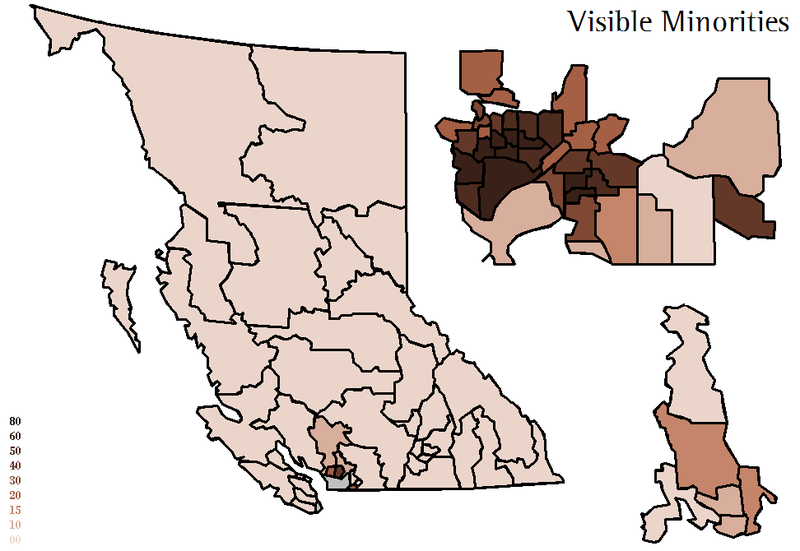 Calgary Centre remains largely white (78.8%), with the largest visible minorities being Chinese (5.9%). Religiously, Protestants make up a narrow plurality (32.6%) of residents while 24.5% are Catholics and 30% claim no religion. There is a fairly big contrast between the downtown core areas of the riding – neighborhoods such as Beltline, Cliff Bungalow, Connaught, Downtown East Village or Lower Mount Royal – and the suburban parts of the riding. The downtown, particularly the aforementioned neighborhoods, have a younger, more ethnically diverse and less affluent population. Most downtown residents are renters, living in apartments or some of the newer high-rise condos close to the Bow River. The downtown neighborhoods, particularly the Beltline, have pockets of deprivation and have struggled with poverty and social problems. On the other hand, the suburban portions of the riding tend to be more affluent. Upper Mount Royal, Scarboro, Elbow Park, Rideau Park, Britannia, Bel-Aire and Mayfair are all very affluent and educated residential suburban neighborhoods. Some of the riding’s outer suburban neighborhoods (Glenmorgan, Glenbrook, Rosscarrock, Killarney etc) are slightly less affluent, made up in good part of older post-war lower middle-class bungalow housing. The riding’s demographics reflect its diverse social makeup. It is the Albertan riding with the highest percentage of never married individuals (48.4%), there are not many households with children (only 14%, one of the lowest in all of Canada), it is highly educated (33.6% with a university certificate, diploma or degree) but not extremely affluent (median HH income is $49,042, the second lowest in Alberta) and a narrow majority of individuals rent their household (53.8%, the second highest in Alberta). It has been said that a riding like Calgary Centre, if located anywhere outside of Alberta, would vote Liberal or NDP. In the context of Albertan federal politics, heavily dominated by the Conservatives (and their predecessors) due to the toxicity of the Liberal Party post-NEP, Calgary Centre is solidly Tory. The last time the seat went Liberal was in 1963, for a single term and the last time parts of the ridings were represented by a Liberal was in 1968. The Tories have held the seat with large majorities since then, taking over 50% of the vote in the 1970s and 1980s. The Reform Party won the seat in 1993 and 1997. The riding was closely contested in 2000, when former Prime Minister Joe Clark, a Red Tory who was the leader of the remnants of the PCs in the 2000 election, ran in Calgary Centre against the Canadian Alliance. The Liberal vote, which fell to only 9.8%, coalesced around Clark, allowing him to win 46-38.5 over the Alliance. In 2004, former PC MP Lee Richardson won the seat for the new Conservative Party, with a 21% majority over the Liberals. Richardson, who had a moderate and pragmatic reputation as a Tory MP, retained the seat in subsequent elections with ever-larger majorities. In 2011, he won a 40% majority taking 57.7% against a paltry 17.5% for the Liberals and 14.9% for the NDP. The Greens have been strong in the riding, taking second with 16.6% in 2008 but dropping to right below 10% in 2011. At the provincial level, Liberals have been more successful – they hold the seat of Calgary-Buffalo. Richardson did very well in the suburban parts of the riding, especially the most affluent residential suburbs – where he took about 70% of the vote. The non-Tories (Liberals, NDP, Greens) have done best in the downtown area – the NDP won 2 polls there in 2011, the Greens won 3 polls in 2008 and the Liberals won a bunch of downtown polls in 2004 and a few in 2006 (and one in 2008). Lee Richardson’s retirement to take up a job with Alberta Premier Alison Redford led to a crowded contest for the Tory nomination. Ultimately, Joan Crockatt, a journalist who was viewed as Prime Minister Harper’s favourite candidate and one of the more right-leaning candidates, won the Tory nod. For some reason, her choice went down pretty badly in Calgary Centre – was it because she was perceived as the candidate imposed by the PMO, because of her proximity to the Wildrose Alliance rather than the PCs in provincial politics or just other unsuccessful CPC nomination candidates who were particularly bitter? Polls showed the Liberal candidate, Harvey Locke (a conservationist and former provincial party president), within striking distance of the Tories and the Greens (their candidate was Chris Turner, a journalist and author) pulling over 20%. Crockatt retained a small lead in later polls, but this was the most closely watched by-election of the three. Liberals feared that their momentum might have been brutally halted late in the campaign, following the comments made by Liberal MP David McGuinty (he said that Alberta Tories should “go back to Alberta” and that they have a ‘protectionist’ view of the energy industry) and even Liberal leadership candidate Justin Trudeau (in 2010, he said that Canada was not doing well because Albertans control “our community and socio-democratic agenda”). The Conservatives retained the seat, although with a 4.2% majority which is a very far cry from Lee Richardson’s 40 point margin in May 2011. However, what counts for them is that they retained the seat and averted a huge PR disaster – which the Harper government is always very keen on avoiding. Of course, the fact that they came within 4% of losing a seat which has been solidly Conservative for ages should be worrying for the Tories, though it would still be risky to extrapolate any provincial (let alone) national trends from this result. Crockatt was probably a bad candidate, despite being rather well known on the Calgary media circuit, and she is probably to the right of her fairly socially liberal and ‘Red Tory’ constituents. The Tories will need to dissect what happened, but I would wager that this by-election is one of those fluke by-elections which don’t portend any future trends. The Liberals had a good result, but because they had focused their sparse resources on the riding to the exclusion of the two other ridings, a defeat – even if it is by a very close margin – will be disappointing for them. The Liberals have shown that, under particular circumstances and low turnout, they can come close to the Tories even in solidly blue Calgary. With such a close race, Liberals will be left wondering if they could have won the seat if McGuinty had not said what he said and the 2010 Trudeau tape had not been put back in the front light. However, no polls showed the Liberals actually leading in CC – even prior to the McGuinty/Trudeau comments – and their 32-33% of the vote on November 26 is basically where the polls had placed them. Yet, the Liberals are not on the verge of breaking through Harper’s “Alberta Firewall”. Polls do show that Tory support has dropped from the 67% they won in the province in May 2011, but at 58-60%, it’s not really catastrophic for them and the fact that both the Liberals and NDP have definite problems in reaching out to Albertans makes it easier for the Harper Tories in Alberta. The Greens were the true winners, taking a very big 25% of the vote. The NDP did very badly, which could be a reflection of the local unpopularity of Thomas Mulcair’s comments about the “Dutch disease” in relation to Alberta’s oil sands, but it is probably more a reflection of the fact that the NDP didn’t bother contesting the by-election, certainly not with a strong candidate like the Grits or the Greens. Interestingly, turnout in CC was the lowest of the three by-elections at only 29.4%. As a urban core riding, it has always tended to see lower turnout levels, but one would have expected heavier turnout considering the high stakes and close contest. Did Tories unhappy with Crockatt choose to stay home? This seems likely a good explanation, considering the Tory raw vote dropped from 28.4k in 2011 to 10.1k in this by-election while the Liberals won about 400 more votes and the Greens took an extra 2.2k votes. The Greens, who have proven that they can attract ‘Red Tory’ voters with some success in the past, likely took votes away from the Tories and the NDP (they lost about 6.2k votes). This is one of those by-elections where poll-by-poll data will be warmly welcomed. The riding of Victoria includes the city of Victoria, the provincial capital, the suburban district of Oak Bay and parts of the district of Saanich. The riding is predominantly white (85%) with the largest visible minorities being Chinese (4%). In Victoria, the largest religion is the lackthereof: in 2001, 40.5% of residents claimed no religious affiliation while 35.4% were Protestant. Victoria is a popular tourist destination and an attractive city, with a growing lucrative high-tech sector. Home to the University of Victoria (UVic), the city has a large non-local student population. Like most of coastal Vancouver Island, the Victoria region is particularly attractive for affluent retireees who enjoy the temperate climate and the city’s usually relaxed pace. The city of Victoria itself has a diverse mix of unionized civil servants in neighborhoods such as James Bay and Fairfield, artists and students in Fernwood or downtown and young professionals who were drawn by the new high-tech sector in the city. Despite being a popular tourist destination and largely white-collar city, Victoria has pockets of deprivation and homelessness, loitering, panhandling and drug use continue to cause problem in some lower-income areas in downtown Victoria. Oak Bay, an old streetcar suburb, is wealthier and older. Parts of Oak Bay, notably Uplands and Ten Mile Point, are very affluent and popular with retirees. Some other parts of Oak Bay have some students, academics and public sector professionals. Parts of Victoria have seen pricey high-rise condo towers spring up, attracting more previleged retirees. Demographically, this is a fairly old riding with the median age being 45 and the percentage of individuals over 15 being one of the highest in Canada (90%). Victoria has high percentages of widows and divorcees, but also a fairly large percentage of singles who never married (39%). There are relatively few households with children. The riding, unsurprisingly, falls in the upper tier of ridings in terms of education: 31% of residents have a university degree. 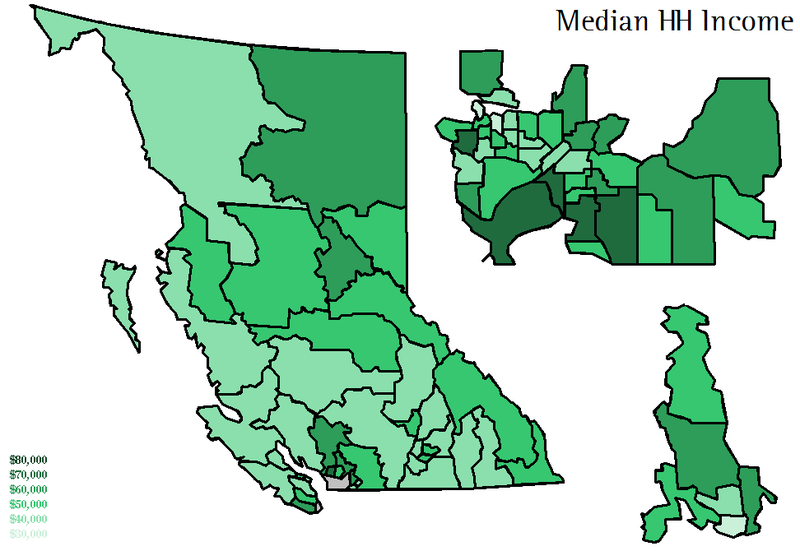 In terms of income, however, the riding is generally ‘poor’ with a median HH income of $43,045, the second lowest in BC. 52% of residents rent their household. Once upon a time, the famously monarchist and old English Protestant city of Victoria was a Tory stronghold. The Conservatives held both seats in the two-member riding between 1882 and 1902, in 1878 Prime Minister Sir John A. Macdonald won the seat (despite having never even been to Victoria) following his defeat in his native riding of Kingston. The Tories held the seat again between 1908 and 1937. In later years, the Liberals and Conservatives played back-and-forth over the seat, with the Liberals holding the seat from 1937 till 1957 and again between 1963 and 1972. The Tories held the seat under Diefenbaker and then between 1972 and 1988, when they lost it to the NDP. In the space of six years, Victoria has become a solid NDP seat, but 1988 was the only time prior to 2006 that the NDP held the seat. Between 1993 and 2006, David Anderson, a popular Liberal who served as Minister of the Environment between 1999 and 2004 held the seat with comfortable majorities. In 2004, Anderson defeated David Turner (NDP), the former mayor of Victoria, by 4 points. However, the Liberals failed to hold the seat in 2006, when the NDP’s Denise Savoie won the seat with an 11% majority over the Liberals. Since then, the Liberal vote has collapsed in Victoria, bleeding votes left and right. Savoie was reelected in 2008 and 2011 (with a 17% and 27% majorities respectively) but in both elections, the Tories placed second while the Liberals were relegated to third (with only 14% in 2011). The Greens have polled strongly in Victoria since 2004, most recently winning 11.6% in 2011. In the 90s and early 2000s, the Liberals were dominant throughout the quasi-entirety of Oak Bay, doing very well in the most affluent areas, but they also had strength in parts of Victoria – including Fairfield and parts of James Bay. The NDP’s base was and remains the lower-income neighborhoods of Fernwood or North Park. Since then, however, the Liberals lost votes to the Conservatives in the affluent parts of Oak Bay and in the condo polls along the coast, while the NDP has secured very strong support throughout Victoria. In 2011, the Tories won the Uplands and Ten Mile Point neighborhoods of Oak Bay along with a few condo polls, while the NDP won practically everywhere else. This by-election followed Denise Savoie’s resignation for health reasons. The NDP candidate was Murray Rankin, an environmental lawyer. The Liberals nominated Paul Summerville, who had ran for the NDP in St. Paul’s (Toronto) in 2006. The Conservative candidate was Dale Gann. Victoria is next door to Saanich-Gulf Islands, held since May 2011 by the Green leader, Elizabeth May. The Greens nominated Donald Galloway, a UVic professor. The Greens have targeted Victoria as a potential riding for a “second Green MP” in the 2015 election, and ran a strong campaign in this by-election. The NDP held the seat, but with a 2.9% margin it is too close for comfort. The NDP had been expected to retain the seat despite a strong Green challenge, but the Greens got closer to actually winning the seat (on election night, early results had the Greens leading) than anyone had expected. The NDP had likely not invested as much in this campaign as it should have, while the Greens – boosted by the presence of their colourful and energetic next door in SGI – targeted the seat and apparently ran a very strong campaign locally. The Conservatives and Liberals, who in the past had fought for the seat, fought for distant third and fourth place in this by-election. We should not read too much into the horrible Conservative result, given that the Tories generally see their vote share collapse in by-elections which they do not bother seriously contesting all while being able to poll very strongly in by-elections which they invest significant resources in. The Liberals should be worried by their result, but they too did not run a very active campaign. Victoria had the highest turnout of the three seats contested, at 44%. We hoped that a clear message could be drawn from these 3 by-elections on November 26, but as in so many by-elections it ended in an inconclusive night and mixed messages for all parties. The one thing which is clear is that the Greens won the by-elections. Their vote share dropped in Durham, but they did extremely well in both Calgary and Victoria. Since 2011, the Greens have abandoned their old strategy of contesting every single seat and spreading their sparse resources across Canada. In the 2011 federal election, the Green Party’s campaign was basically all about electing Elizabeth May in SGI, and they were successful – but it was at the cost of losing support in almost every single other riding in the country. That strategy worked in 2011, and the Greens have opted to prioritizing and focusing their resources in the seats where they feel that have a solid shot at winning, even if that means seeing Green support drop even further in the other seats which they do not seriously contest. The Greens ignored Durham – their vote dropped – but they focused on Calgary Centre and especially Victoria. In both of these cases, their investments paid off. Victoria is now a prime Green target in the 2015 election, and Calgary Centre could potentially be promising. These by-elections will not lead to a sustained Green surge in the polls (besides – there’s no federal election until 2015), but the fact that the Greens have chosen to focus their efforts in a few ridings could be bad news for Harper’s opponents, who could see the centre-left/anti-Harper vote divided even further. Could we count the Tories or the Liberals as ‘winners’ in these three by-elections? On the one hand, the Tories did well in Durham (showing that Fortress Rurban Ontario is still very solid) and they averted a PR disaster in Alberta but on the other hand, their vote collapsed in Victoria and CC was unacceptably close for them. Similarly, while the Liberals can pride themselves in a (very) strong result in CC, but on the other hand they did horribly in the other two seats and considering that CC had turned into a must-win for them, a loss stings. The Conservatives remain in a relatively solid position, even if Harper’s government is fairly unpopular and Tory support nationally is only a bit above their traditional floor (30-33%). The Liberals have lots of work ahead of them if they want to regain second place, let alone win power. The NDP had a tough night. Victoria almost created a PR disaster for them, while their support fell off in CC. On the other hand, they did do quite well in Durham – maintaining a respectable second in a seat where second place for the NDP would have been unimaginable prior to the 2011 Orange Crush. Four Canadian federal by-elections yesterday were held in four vacant seats: one in Nova Scotia, two in Quebec and one in British Columbia. Two of them had Bloc incumbents, one had an NDP incumbent and one was held by a formerly Conservative Independent. As a result of the by-elections, two are held by the Conservatives, one by the Bloc and one by the NDP. These elections were spectacularly under-the-radar, even more than usual (2007 had the Outremont-Mulcair thing, 2008 had the Bob Rae-Toronto Centre thing, but these were eerily silent). A by-election was held in the rural Nova Scotian riding of Cumberland—Colchester—Musquodoboit Valley, located in western Nova Scotia. Cumberland—Colchester—Musquodoboit Valley (CCMV) is the most conservative area of Nova Scotia, rural and WASP territory at its best. However, being in Nova Scotia, its brand of conservatism is more in line with old Progressive Conservatism than the Conservative Party’s dominant Reform-Alliance brand. It’s a Red Tory area, some might say, and its former MP was just that. Bill Casey, first elected as a PC MP in 1988, defeated in 1993 by a Liberal, elected in 1997 for a second stint and MP since then, joined the Conservative Party after the PC-Alliance merger but he left the party in 2007 due to a rift over the Atlantic Accord. Massively popular, and facing weak Conservative and Liberal opposition in 2008, he was re-elected with a sky-high 69%, higher than what he had ever won running for the PC or Conservatives. He took not only the large majority of Conservative votes, but also a lot of NDP and Liberal votes (as well as Green votes, the Greenies, although irrelevant here, did not oppose him in 2008). Casey resigned to become a lobbyist for the provincial government, vacating his seat. The Conservatives nominated Scott Armstrong, the NDP nominated Mark Austin, the Liberals nominated Jim Burrows, the Greenies nominated Jason Blanch and Christian Heritage Party leader Jim Hnatiuk also ran. A predictable Conservative victory, but remarkably weak, despite what other say. Casey won over 45% of the vote in all elections since 1997, when he won 43.6% (and 14% for Reform). It might either be a result of low turnout (a whooping 35.7%, still second highest), lower results for non-incumbents lacking a personal vote, or real reticence by some to vote Conservative. The NDP and Liberals returned to better levels, gaining back votes which they had lost to Casey in 2008. Despite the seemingly good Liberal performance, it’s below their result in 2006 (already low), which was the last normal election in CCMV. A by-election was held in the eastern Montreal riding of Hochelaga, one of the Bloc’s safest seats. The constituency covers some of the city’s poorest and most working-class areas, and the area, Hochelaga-Maisonneuve is often known infamously as the city’s ghetto. It’s very white Francophone, thus strongly nationalist. The Bloc has held this seat with huge majorities since 1993. Incumbent Réal Ménard, who has represented the area since 1993, resigned to run (and win) in the Montreal municipal elections. The Bloc nominated, with some controversy, a rather right-leaning candidate in this left-wing district: former PQ cabinet minister Daniel Paillé. The NDP nominated former trade union leader Jean-Claude Rocheleau, who also ran for the party in 2008. The Liberals nominated Robert David, the Conservatives nominated Stéphanie Cloutier, the Greenies nominated Christine Lebel. The neorhino.ca and Marxist-Leninist nominated candidates, and perennial candidate John C. Turmel chose to run here. The rumours of a massive discontent with the Bloc candidate and a subsequent massive switch to the NDP was nothing but the usual uneducated rumours spread around, since such things are unlikely to happen. Hochelaga is no Outremont. Bloc support here is solid nationalism or socialism. A by-election was held in the rural Quebec riding of Montmagny—L’Islet—Kamouraska—Rivière-du-Loup (MIKR). The riding is located on the south shore of the Saint Lawrence, in the Bas-Saint-Laurent region, a rural region east of Quebec City on the opposite shore. The riding includes, amazingly enough, the counties (MRC) of Montmagny, L’Islet, Kamouraska and Rivière-du-Loup. The riding, very Catholic and French, is traditionally nationalist, but like most nationalism in this area, it’s a rather soft sentiment (and much more conservative than Bloc nationalism, which leans left) and the provincial Liberals hold all seats representing this area, including the seat of Rivière-du-Loup, the old seat of ADQ leader Mario Dumont. This is a conservative seat, but was not a Conservative seat. Its MP, the Bloquiste Paul Crête, resigned to run (and lose) in the Rivière-du-Loup by-election. The BQ nominated Nancy Gagnon, the Conservatives nominated well-known local mayor Bernard Généreux, the Liberals nominated Marcel Catellier, the NDP nominated François Lapointe and the Greenies nominated Charles Marois. Turnout was highest in MIKR, a whooping 36.6%. The result is not all that surprising, if you look at the hard facts: the Conservative candidate was well-known locally, Mayor of La Pocatière, so one supposes he had a personal vote. He had the support of the provincial Liberals and all their MNAs in this area. The Bloc candidate was only some staffer or something to former MP Paul Crête, who reportedly had a large personal vote in this rather soft nationalist-conservative riding. The area is of course conservative and soft-nationalist, with aspects similar to Beauce (it’s right-wing economic views, in favour of free enterprise and the like). In addition, the Bloc’s vote against the scrapping of the locally unpopular Liberal government’s gun registry may have helped the Conservatives, who voted in favour of scrapping it, a position popular in this rural riding with some hunters. A by-election was held in New Westminster-Coquitlam, a BC riding in suburban Vancouver. The riding is a traditionally swing riding, though it’s safe to say that it leans NDP. It is around 70% white, not very affluent but not poor either and not very working-class. It is largely residential middle-class, safe to say. The NDP has held this seat since 2006, the Conservatives having won the seat in 2004 primarily due to the fact that the Liberals still polled very well then. The NDP MP, Dawn Black, resigned to run (and win) in the BC provincial election held earlier this year. The NDP nominated Fin Donnelly, the Conservatives nominated Diana Dilworth, the Liberals nominated Ken Lee and the Greenies nominated Rebecca Helps. The Conservative candidate seems to have run a poor campaign, thus this result. Of course, it could be caused by the 30% turnout as well. Unarguably, a strong win for the NDP in a rather marginal NDP area. The Conservatives, of course, did very well in BC in the 2008 election, pretty much maxing out according to most, so they probably had little room for even more growth. The Liberals and Greens did badly, and I suspect most of their lost voters (who did vote yesterday) voted NDP. Overall, the Conservatives won 35.7%, the NDP 24.4%, the Bloc 20.8%, the Liberals 14.8% and the Greenies 3.1%. In 2008, the Bloc came on top of the overall vote. The numbers indicate a strong night for the Conservatives, who gained two seats, and also the NDP, which had an almost perfect night (except for a small loss in percentage in MIKR, but who cares they’d say). The Liberals and Bloc had a bad night. I would put emphasis on the bad night for the Liberals, who despite actually gaining a bit from their 2008 result in these seats (thanks to CCMV), did really poorly elsewhere, even in seat like New Westminster-Coquitlam where they had already done awful in 2008. It’s a poor reflection on Michael Ignatieff, the leader of the Liberal Party. Also a bad night for the Greens, but they always do poorly in by-elections, so no biggie. Though I do predict they won’t gain much in the next federal election, whenever it will be. Status-quo and politics as usual have prevailed in British Columbia, in a rather dull election. Gordon Campbell’s Liberals have been re-elected to a third term, and both the seat count and popular vote have shown quasi-irrelevant movement. As the results showed, status-quo prevailed at unprecedented levels since the SoCred days. In fact, only two incumbents were defeated last night: John Nuraney (Liberal) in Burnaby-Deer Lake won 46.3% to the NDP’s 48.2% and Jenn McGinn (NDP) in Vancouver-Fairview won 42.2% against the Liberals’ 47.2%. Of the ridings I identified as close in my second post, only Stikine, Vancouver-Fairview (covered above) and Nanaimo changed, the first from Liberal to NDP and the latter from NDP to Liberal. In Maple Ridge-Mission, a notionally NDP new creation, the Liberals won. The Liberals won the notionally Liberal new seat of Boundary-Similkameen. Other than that, those ridings stayed with their old party, unsurprisingly. Two seats will go to a judicial recount. In the Vancouver area seat of Delta South, Wally Oppal (Liberal) has defeated the Indie Vicki Huntington by a mere two votes. In Cariboo-Chilcotin, the margin between the winning Dipper and the Grit is 23 votes. Turnout was an atrocious 52%, a major drop since 2005. This is the latest in a series of preoccupying declines nationwide, with 58% in the 2008 federal election and 57% (down from 71%) in Quebec’s 2008 election. Just in the late 1985, nearly 70% of British Columbian voted. And with their rejection of electoral reform, this trend is unlikely to be broken. Unsurprisingly, the party strongholds remained the same. The NDP now quasi-entirely dominates the North Coast, the Pacific coast, and Vancouver Island. Especially in the North Coast, a lot comes from the important Native communities but also due to the strong precense of logging and manufacturing in the area. The same thing in the Cariboos ridings. In Victoria, only the wealthiest coastal communities evade the NDP’s omnipotence. In Vancouver proper, the NDP is based on the city’s famous “east side”, the poorest areas of Vancouver. In Burnaby, the same thing. Both of the NDP’s seats there are seats with low income levels. In Surrey, the NDP is especially strong in the poorer blue-collar Indo-Canadian neighborhoods, and weaker in the wealthier outskirts of Surrey. The Liberals are strong in the non-industrial rural agrarian interior parts of BC, which are some of the Conservative Party’s strongest areas federally. In more urban areas, the Liberals dominates the northern suburbs of Vancouver, such as West Vancouver-Sea to Sky, and ridings with an important percentage of wealthy retirees. In Greater Vancouver itself, the Liberals win Vancouver’s much-wealthier “west side” and also the Chinese (though equally wealthy) areas of Richmond. Ironically, part of that strength is probably due to voter loyalty to the “Liberal” name federally, which carries over to the provincial Liberals, despite the vast differences between the two. The Greenies had a deceiving night last night, with only 8.1% of the vote, less than the 9% they received in 2005. They probably suffered the most from the atrocious turnout, given that Green supporters are often the least likely to turn out. Geographically, the Greenies did best where you expect them to. Their best result was 22% in West Vancouver-Sea to Sky, a wealthy northwestern Vancouver suburb. They got their other best results in Victoria, downtown Vancouver, and the Kelowna area (not the city core itself, but its suburbia). As always with Greenies, their lowest results were either in low income areas or heavily blue collar areas. The BC Conservatives, who ran a “record” 24 candidates won a decent 2.11% of the vote overall. This averages out to around 8% in the ridings in ran in, with lows at around 2-3% and a high in Boundary-Similkameen at 20.17% (the Tory candidate, Joe Cardoso, was a former Liberal). Its best results were concentrated in the BC Interior. Its few candidates in Vancouver or Vancouver Island polled significantly lower than their comrades in the Interior. The Conservative leader, Wilf Hanni, got 10.05% in Kootenay East. While the Conservatives remain a fringe in BC politics, and they probably didn’t prevent any Liberal victory, their continued growth off of discontented Liberal supportes (such as Joe Cardoso) could prove a non-negligible threat to the Liberals in the near future. CBC.ca has an interactive map of results here. There was a huge turnaround in the electoral reform referendum, and STV was dealt a severe blow, sadly enough. I choose to blame the new ballot question used this time around. The old 2005 ballot was a yes or no question to electoral reform, while this year’s ballot is a choice between the “existing FPTP” and the “STV blablabla”. Since a huge majority of voters probably had no clue was single-transferable vote was (a lot of Irish voters probably aren’t entirely sure what STV is, despite Ireland using it for a long, long time), they voted based on their little to no knowledge of the proposal. When asked if they wanted a nice little cute-sounding “STV” in 2005, they said yes. However, when asked to chose between the existing junk and the proposed new system, they prefered the current system to something they have no clue what it is. The same thing probably played a large role in the defeat of the MMP proposal in the Ontarian election in 2007. Perhaps the change of mood was also partly based on the years passed since the 1996 and 2001 BC elections showed how FPTP was a worthless junk system. Voters don’t remember those atrocities, so they see no reason to vote against a system they know. The referendum passed in only 7 ridings, all of them urban core ridings in downtown Vancouver and Victoria. Similar to how the only ridings to vote in favour of MMP in Ontario two years ago were downtown Toronto constituencies. The cause of electoral reform is probably dead in BC for quite some time now, sadly. And this won’t do anything to help the case of turnout, which is also pre-occupying. British Columbia is voting as I’m writing this, and results will come out late tonight for us people on the eastern seaboard of North America. If you do happen to follow the results, either on the telescreen or the interwebs, I thought a few demographic maps by riding would help out a bit for comprehension of the results. These maps are quite few, since they take time to do, and not all are useful. The insets are Greater Vancouver (on top) and Victoria (on the bottom). Visible minorities (aka, non-white people). Larger. Largest visible minority group by riding. As I say in fine print on the map, results in riding with very tiny percentages of visible minorities are obviously based on a “small sample”, so to put it. The map is more useful for ridings with higher percentages, especially in Greater Vancouver. Larger. Median HH Income, self-explanatory. Larger. Aboriginal people, also self-explanatory. Larger. Eh, not much time for analysis, so I’ll leave that up to you. Enjoy, and needless to say, this is just the beginning of posts on BC! As for the editorial endorsements, Greens for legislature and STV for the referendum. In my first post yesterday I briefly outlined BC’s fascinating political history up till the 2005 election. In this post I will attempt to outline the electoral developments since 2005, the parties, the polls, the new seats and so forth. I alluded to the parties in BC in the first post only so briefly, so I decided to post some more stuff on the parties. BC has a largely two-party system, Liberal and NDP. The Liberal Party, which has no affiliation with the federal Liberals and are more similar to the federal Tories than anything else. The BC Liberals include federal Conservatives (ex-Reform/Alliance types too), some federal Liberals, most of the old-days BC Liberals, and the ex-SoCreds who didn’t end up in prison. These Liberals are more liberals in the classical European sense than in the perverted American sense where liberalism is somehow left-wing. In office, the Liberals have reduced corporate income taxes, reduced welfare roles and some social services, privatized BC Rail, cut income tax by 25%, and abolished the NDP’s corporate capital tax for most businesses. The economic managment has been generally successful, with unemployment reaching lows, and improved business confidence. On the other hand, the Liberal government also introduced North America’s first carbon tax, a move which frustrated the most conseratives in the party. The BC NDP is affiliated with the federal NDP and its supporters are the federal NDP supporters but also a sizeable share of federal Liberals. The party is quite diverse, including the social liberal/urbanite/quasi-Greenie wing and the traditional more socially conservative blue-collar wing. In the logging protests in the 1990s, the ironic thing was that both the loggers and the environmentalist protestors both voted NDP in the past elections then. Though the environmental protestors are probably Greenies right now. I don’t think I really need to explain the NDP’s actual policies that much. An interesting factor in this election could be the Conservative Party, which I alluded to when discussing parties in my last post. This election, the Conservatives will field around 20 candidates, and strong Conservative performances in some ridings could seriously hurt the Liberals. The Conservatives have said that the Liberals are not right-wing enough. Abbotsford South (Liberal): Fraser Valley. Safe Liberal, with minimal NDP strenght in urban areas. Boundary-Similkameen (Notional Liberal, but 1 Liberal MLA and 2 NDP MLAs): BC Southern Interior. Very tight marginal by the looks of it, but notionally Liberal 46/NDP 41. The Conservative Party is running a former Liberal here- might hurt the Liberals. Coquitlam-Burke Mountain (Liberal): Lower Mainland. Safe Liberal, with very Liberal rural areas and NDP areas in the Port Coquitlam areas of the riding. Nanaimo-North Cowichan (NDP): Vancouver Island. Safe NDP seat with a large native community and an important logging industry. Surrey-Fleetwood (NDP): Surrey/Fraser Valley. Tight notionally NDP seat with a large immigrant (Indo-Canadian) population. Vancouver-False Creek (Notional Liberal, 2005 riding has NDP MLA): Downtown Vancouver. New riding created from Vancouver-Burrard (NDP since 2008). Safe Liberal in wealthy, educated downtown Vancouver. Some University campuses. There is a great site out there, bc2009.com, which has further information and maps for all ridings. Burnaby-Lougheed (Liberal): GVRD/Burnaby. Notionally 47/44 Liberal. Immigrant population nearly 50%. NDP strength around Simon Fraser University, generally Liberal outside of that with a few exceptions. Burnaby-North (Notional NDP, Liberal incumbent): GVRD/Burnaby. Held by a Liberal, but redistribution gives the Dippers a 46/45 advantage. Should be very tight. Coquitlam-Maillardville (NDP): GVRD/Coquitlam. Notionally NDP 47/45. Generally typical suburbia, but there is a significant industrial area along the waterfront. Vancouver-Fairview (NDP): Vancouver city. Old riding of relatively similar boundaries held by the NDP in a 2008 by-election. New riding loses some NDP areas in False Creek, but gained some back in the southeast. The Liberal machine didn’t GOTV in the 2008 by-election, and a better GOTV this year is primordial for them. Maple Ridge-Mission (Notional NDP): Fraser Valley/Maple Ridge. A marginal NDP seat notionally, with most of the NDP strength in urban industrial areas of Maple Ridge and Mission. Surrey-Fleetwood (NDP): New seat. See above. Cariboo-Chilcotin (NDP): Northern Interior. The NDP has an edge on notional figures, 47/44. The riding is nearly 20% aboriginal and is heavily dependent on lumber and logging. Redistribution has probably helped the NDP. Cariboo North (NDP): Northern Interior. A dead race even on notionals, the NDP’s numbers have no doubt suffered from the loss of Williams Lake to Cariboo-Chilcotin. Another riding dependent on lumber and logging. Stikine (Liberal): Northern Interior. The largest and least populated riding in British Columbia. As expected, the riding is one-third native and is also dependent on lumber/logging (but also manufacturing, tourism and some agriculture). Kamloops-North Thompson (Notional NDP, Liberal incumbent): Southern Interior/Kamloops. This riding has a Liberal incumbent, but significant boundary changes in the Kamloops areas have made this seat notionally NDP (45/43). The new riding includes the most NDP-friendly parts of Kamloops, which outnumber the rural Liberal areas (in addition to this, the NDP is strong on native reserves out there). Comox Valley (Liberal): Vancouver Island, and one of the few ridings left untouched by redistribution in 2008. Some industrial areas, but the riding is becoming more of a retiree destination and there is a more right-leaning Canadian Forces Base in Comox. Nanaimo (NDP): Vancouver Island, including a large majority of the city of Nanaimo. The redistribution has undoubtedly helped the Liberals a lot, turning the old safe NDP riding into this more marginal (though still NDP) riding. North Island (NDP): Northern (sparsely populated) Vancouver Island. The riding has a sizeable native population and is economically dominated by fishing and logging. Oak Bay-Gordon Head (Liberal): Vancouver Island/Victoria. Very wealthy and educated suburbs of Victoria, with Liberal coastal areas but more NDP areas inland and around the university. Saanich South (NDP): Vancouver Island/Victoria. Tied riding on notionals, but NDP incumbent. The coast, quite Liberal, is a prominent spot for retirees and by consequence very wealthy. Inland areas are more NDP. As to polling in this election. On that front, the pollsters have been either a) inconsistent or b) downright crappy pollsters. However, the later polls up to now seem to agree that the Liberals have an edge over the NDP. Impossible to conclude how large that gap is, though. Also though to gauge where the Greenies stand. While all polls show them over 10%, the Greenies lost votes (quite a bit) in both November 2008 by-elections. Is that a trend which is real, or just the effect of joke-level turnout? The most reliable pollsters of the bunch, Angus-Reid (all bad reputation aside, Angus-Reid nailed the 2008 federal election) and Ipsos-Reid have the following results. British Columbia’s Lieutenant Governor, Steven Point, dissolved British Columbia’s provincial legislature yesterday, as expected, calling an election for May 12, 2009. British Columbia, Canada’s 3rd province in terms of inhabitants and a very culturally diverse province is currently governed by Liberal Premier Gordon Campbell. The last election was held in 2005, and BC has fixed-date elections. British Columbia has had an entertaining and quite unique political history. Political parties were introduced only in 1903, and the first party system was a regular Liberal/Conservative setup. The Conservatives were totally destroyed by the Great Depression, so greatly destroyed that the party couldn’t even field a common slate of candidates in the 1933 election. The Liberals won the 1933 election, with the social democratic Co-operative Commonwealth Federation (CCF) taking official opposition status. Despite rebounding in 1937 and 1941, the Conservatives were effectively destroyed by the Great Depression. However, with a “red threat” from the left-wing CCF, the Liberal Party and Conservative Party formed a coalition government following the 1941 election. This coalition won the 1945 and 1949 elections massively, but in 1951 the Liberal-dominated coalition collapsed and Liberal Premier John Hart led a minority government which collapsed in 1952. However, the coalition had introduced alternative vote-IRV with the idea that coalition voters would second pref the Liberals or Conservatives and continue to keep the evil communists out of power. Except that in 1951, a Conservative MLA, W.A.C. Bennett, ran and lost for the Conservative (now known as Progressive Conservative, PC) leadership. He got pissed and joined the small Social Credit League, which originally espoused social credit monetary theories. However, Bennett dropped that crap and turned the SoCred into a populist and conservative party opposed to the “red threat” of the CCF (now NDP). The SoCreds used the AV-IRV system to their advantage in the 1952 election and got Liberals and Conservatives to preference SoCred candidates in first or second, electing 19 SoCred MPs (CCF 18, Liberal 6, PC 4, Labour 1) despite SoCred polling only 30.2% against 34.3% for the NDP. The SoCred minority became a majority in the 1953 election and the Liberals and Conservatives became irrelevant while refusing to die. BC returned to a tw0-party system: SoCreds, which united the entire anti-NDP group, and the NDP itself. The SoCreds returned to FPTP and ruled until 1991, with the exception of a brief NDP majority between 1972 and 1975. The later SoCreds, apart from being crooks, also became much more socially conservative (under Premier Bill Vander Zalm) and moderates abandoned it. In 1991, the SoCreds lost 40 seats while the NDP gained power and the Liberals (on the back of a great debate performance) were re-juvenated. Despite a scandal, the NDP was narrowly re-elected in 1996. The NDP’s 1996 victory was due in part to a split in the right-wing vote. Former Vancouver Mayor Gordon Campbell became the Liberal leader in 1993 after the then-Liberal leader, Gordon Wilson left the party due to an affair with another MLA (Wilson later founded his own party which won one seat in the 1996 election, but Wilson joined the NDP to get a cabinet job). In 2001, Campbell’s Liberals defeated a scandal-ridden NDP government in a massive landslide, taking 77 seats against 2 for the NDP. The Green Party polled 12.4% and the Marijuana Party polled 3.2%. Campbell won a much more narrow majority in 2005. BC effectively has a two-party system, Liberal vs. NDP. However, the BC Liberals are independent of the federal Liberal Party and are in fact more conservative or centre-right than anything else. The BC NDP is affiliated with the federal NDP and remains quite left-wing. British Columbia has a strong Green Party, which won 12.4% in 2001 (but declined to 9.2% in 2005), which is similar to the federal Green Party. There also remains a small rump Conservative Party, a continuation of the original Conservatives/PCs. These Conservatives won 0.6% in 2005. In 2005, British Columbia held a referendum on switching to a single-transferable vote (STV) system. Depsite winning 57.7% of the vote and winning all but two of the 79 constituencies, it failed since the law required a 60% majority for it to pass. The STV option will be on the ballot again this year. If you don’t understand STV, CBC.ca has a slightly silly but basic tutorial online. For a more detailed look, the EBC has a map of the proposed STV constituencies as well as the 85 constituencies in use this election. Here are the 2005 results, for reference’ sake. Hopefully I’ll be able to post some maps and demographic profiles on a few constituencies in play this election, as well as recent polling and all that fun stuff between now and the election. In the meantime, play around with CBC’s riding profiles. CBC has done some very nice interactive maps in the last few elections here in Canada, so hopefully they won’t let us down this time.